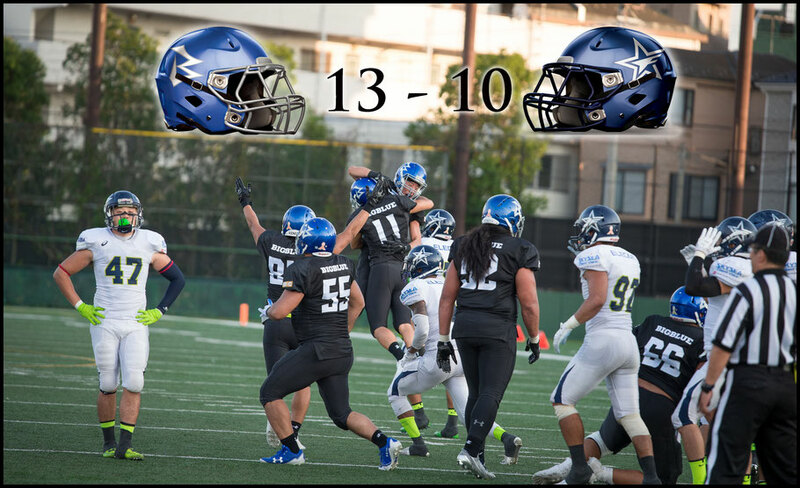 13-10 on Monday in Kawasaki. 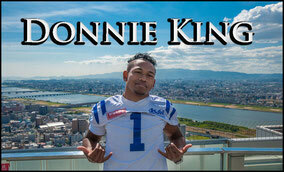 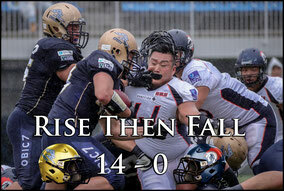 The Kansai side will be wondering just how they lost a game that had seemed to be in the bag more than once. Having led with 15 seconds left in regulation, they also had a chance to kick the winner in overtime, but that 40-yard effort sailed right. 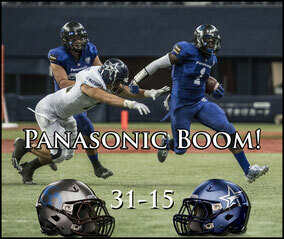 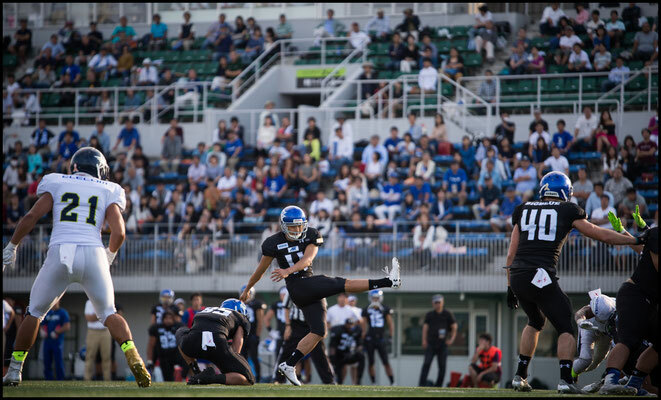 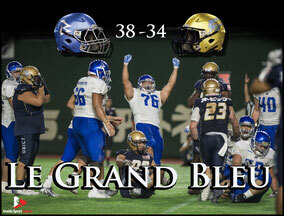 Finies got the ball back immediately but three plays later, on 2nd & goal DB Tatsuma Kobayashi jumped a short Kenjiro Kasuya pass to the right and on the ensuing possession Toshiki Sato made no mistake from 34 yards out to keep Big Blue one win behind the first placed Panasonic Impulse. 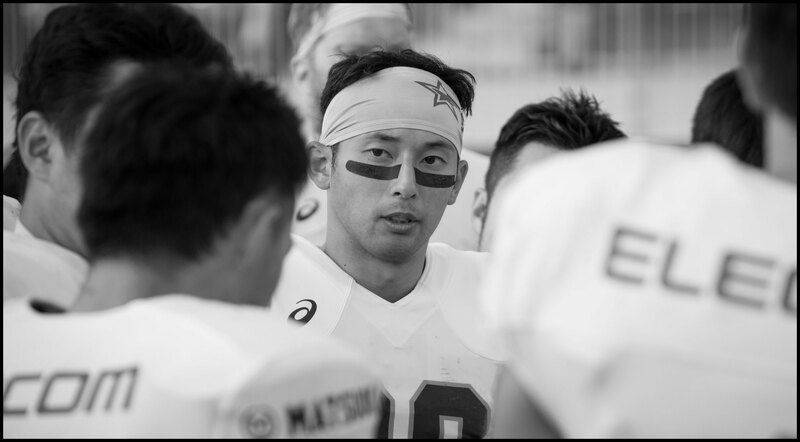 Kobe will now need to defeat either Asahi Beer Silver Star this coming weekend or Lixil Deers in round six to ensure they make the postseason. 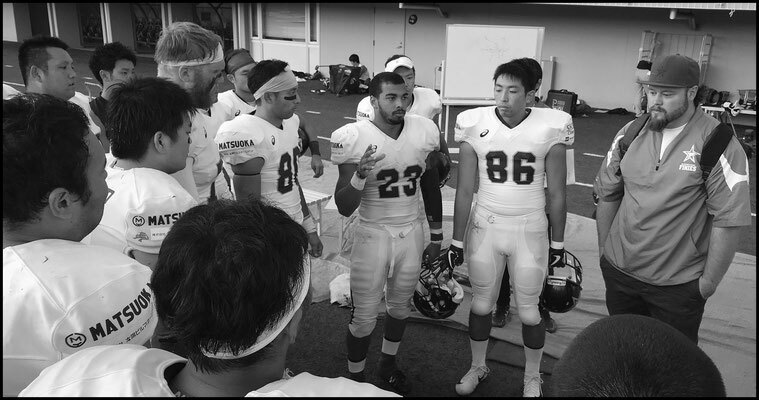 Scoreless at the half, the game was a tight defensive battle all the way. 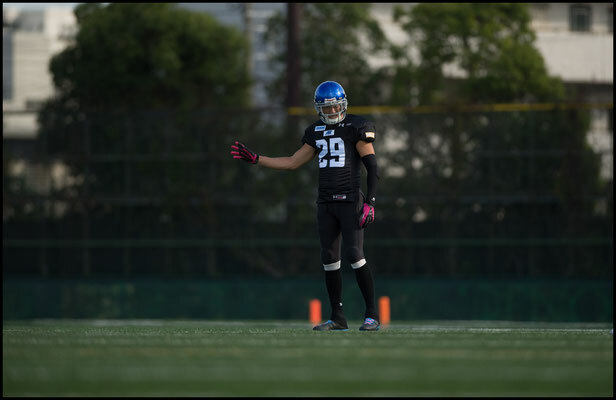 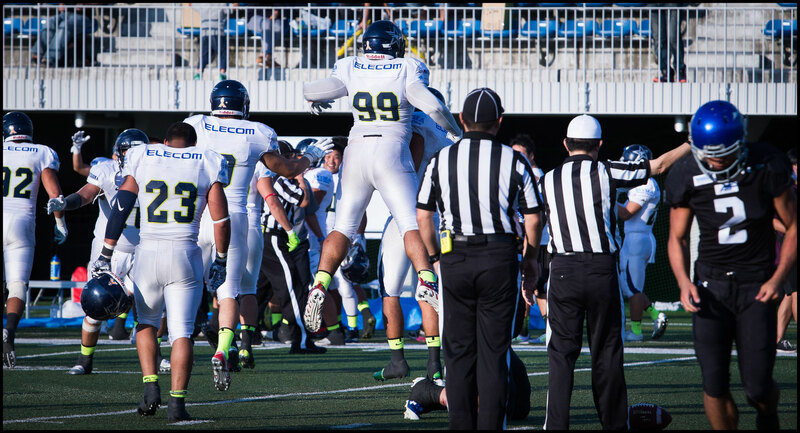 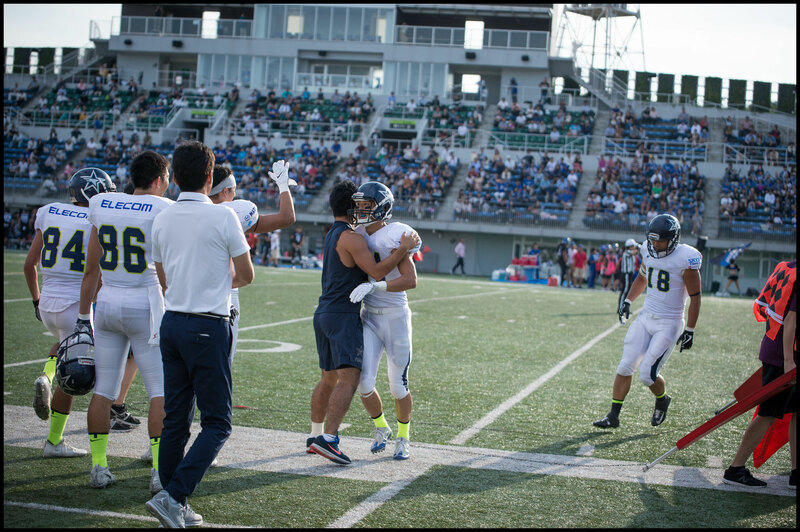 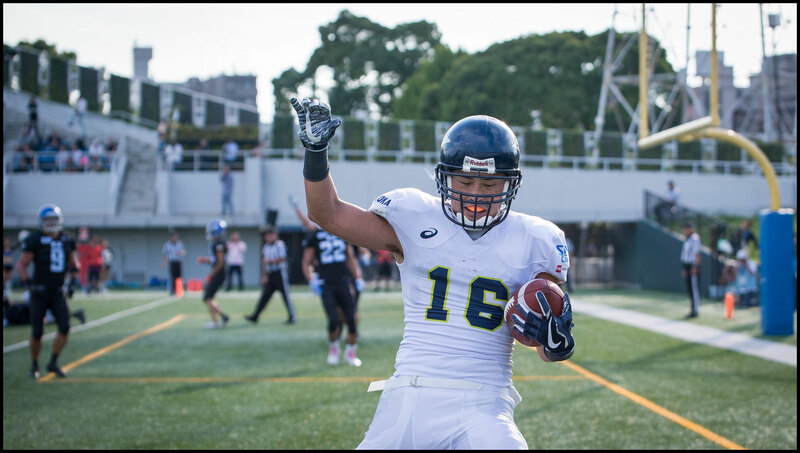 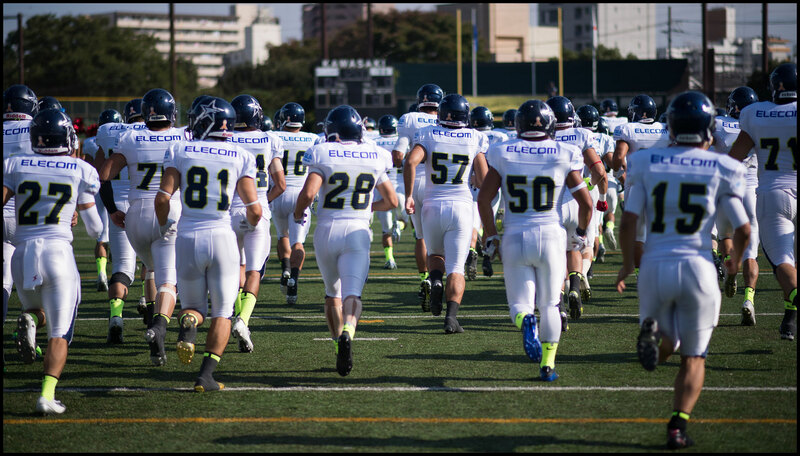 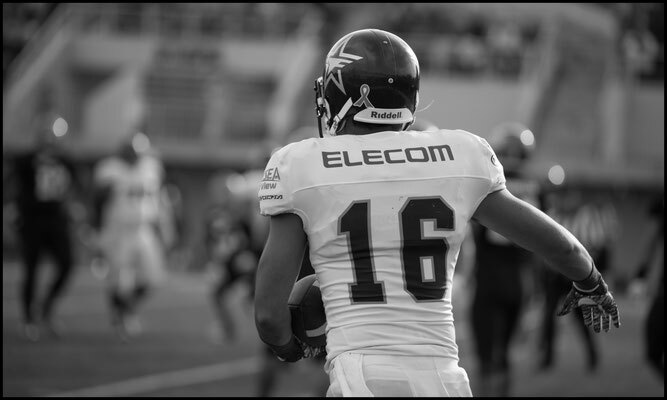 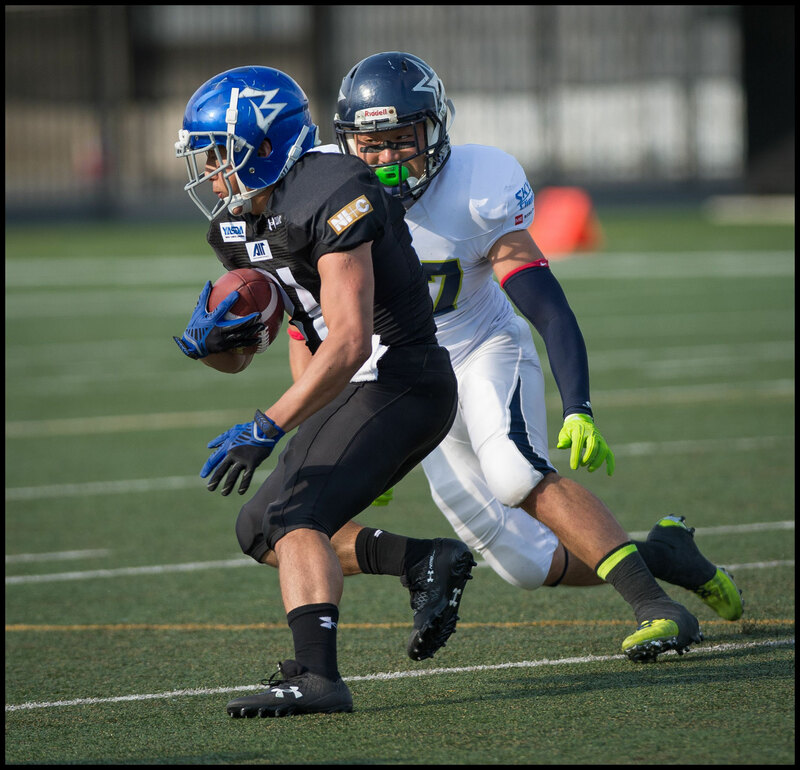 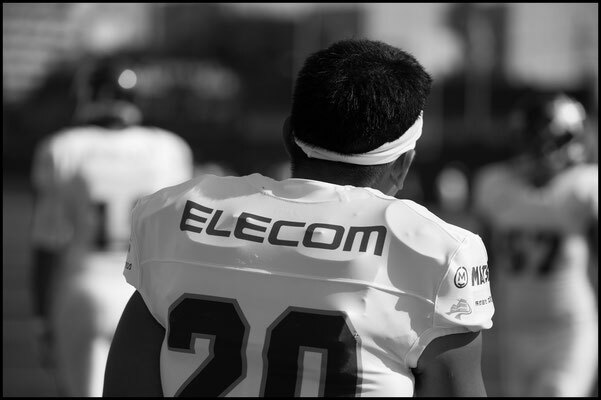 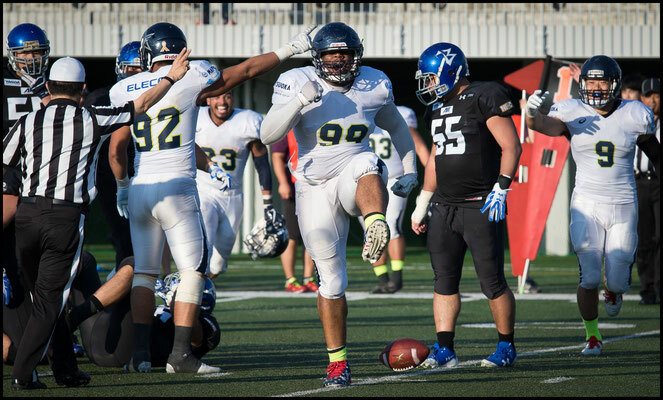 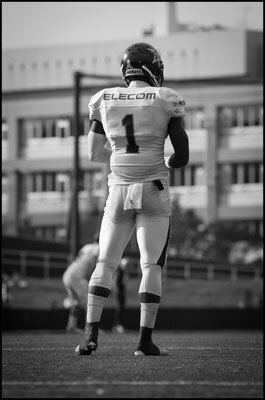 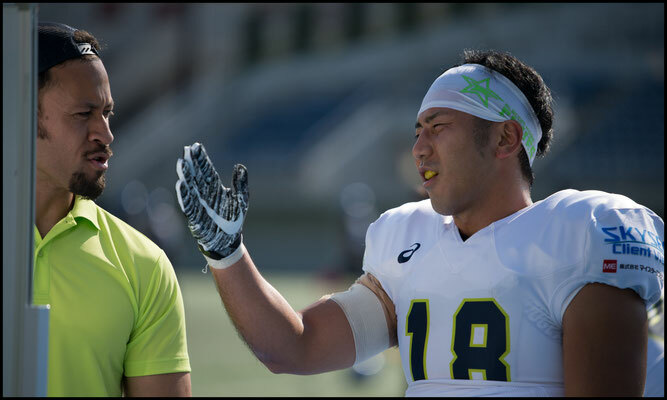 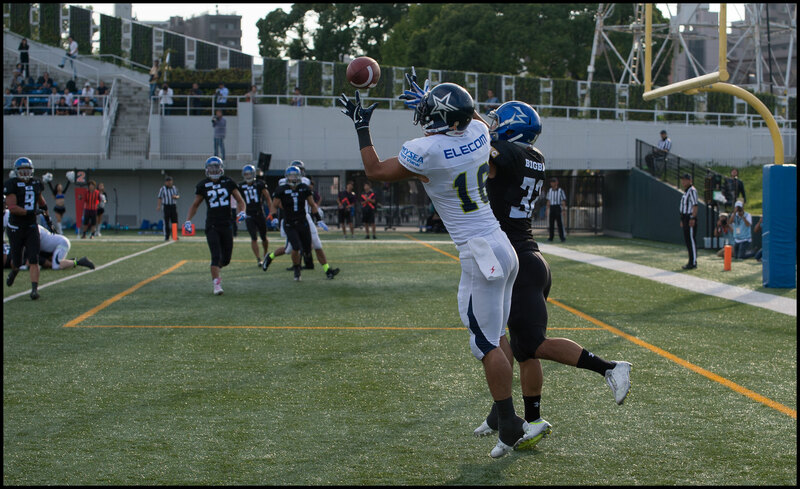 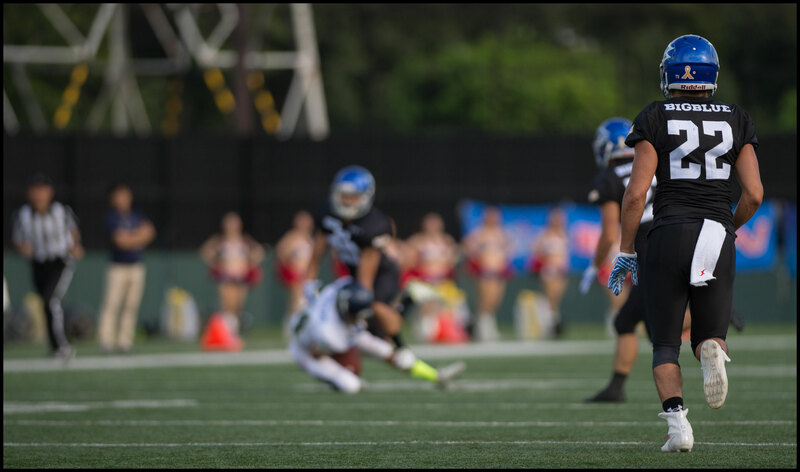 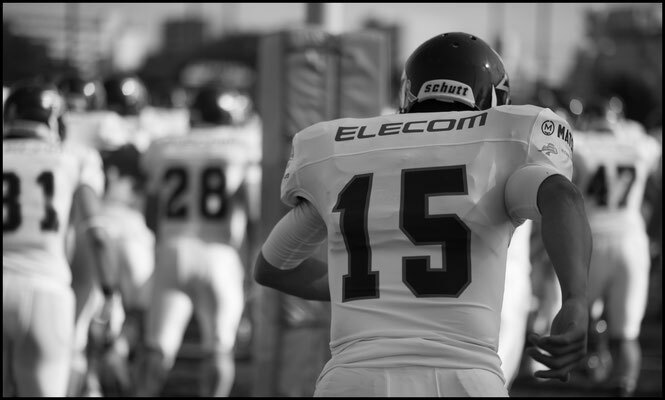 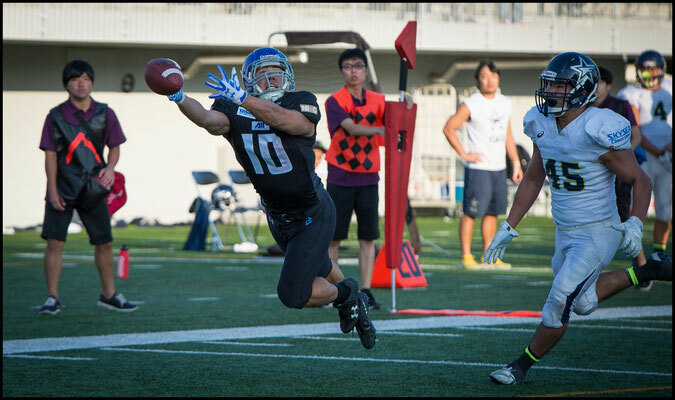 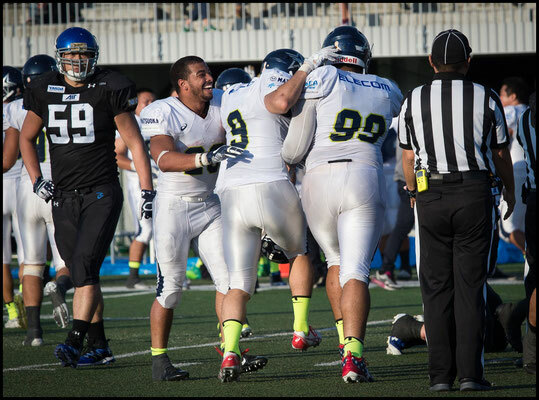 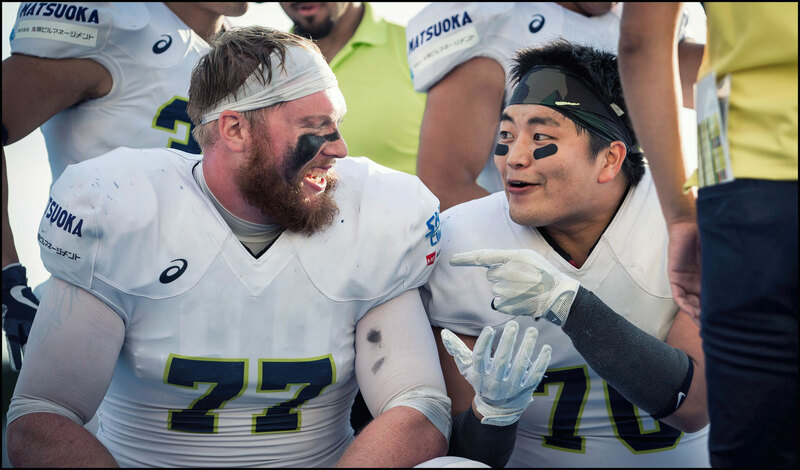 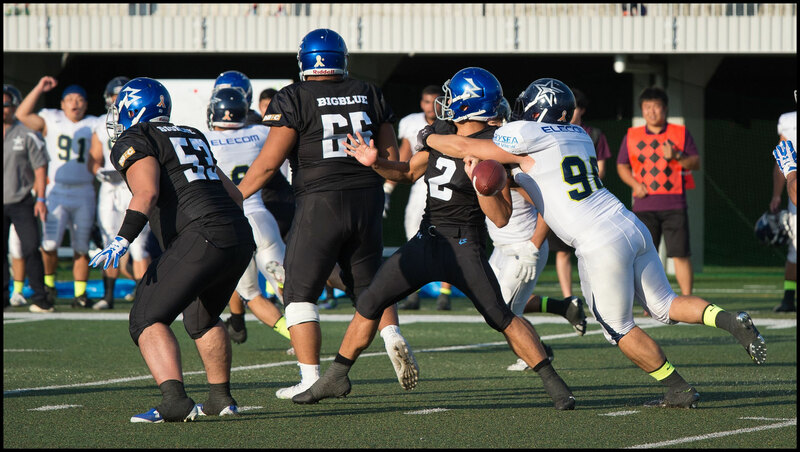 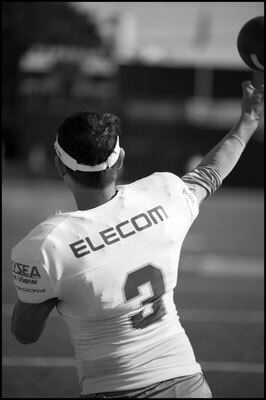 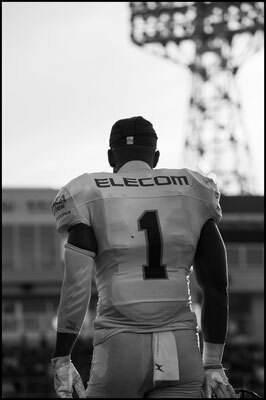 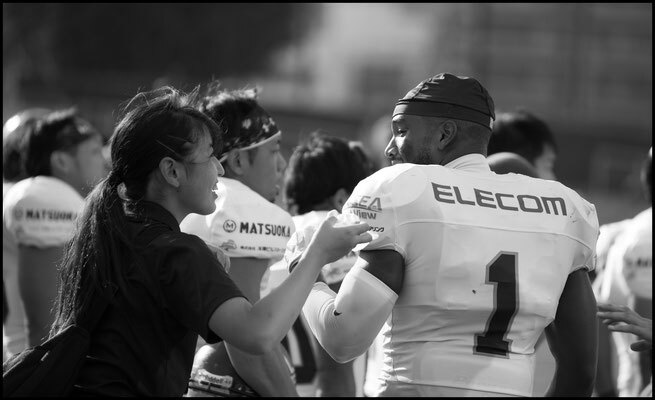 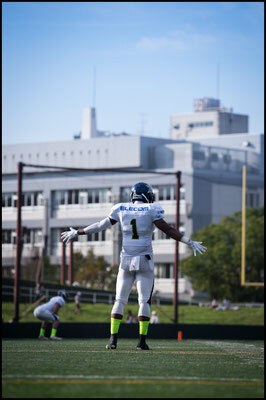 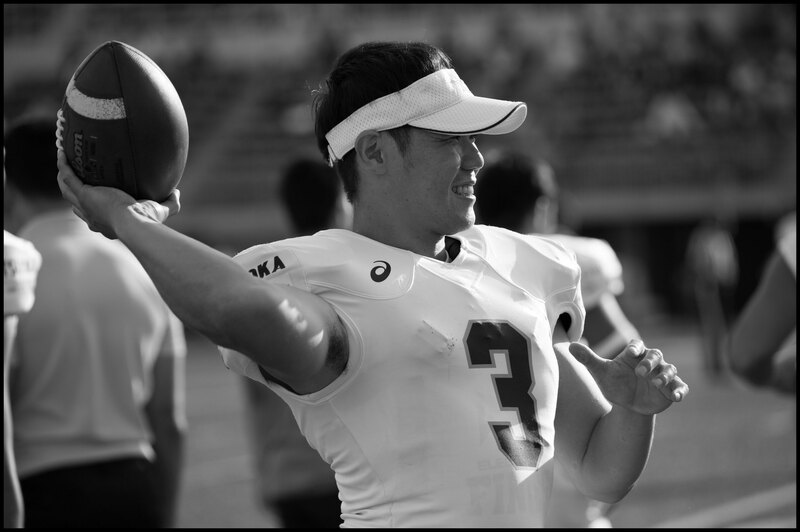 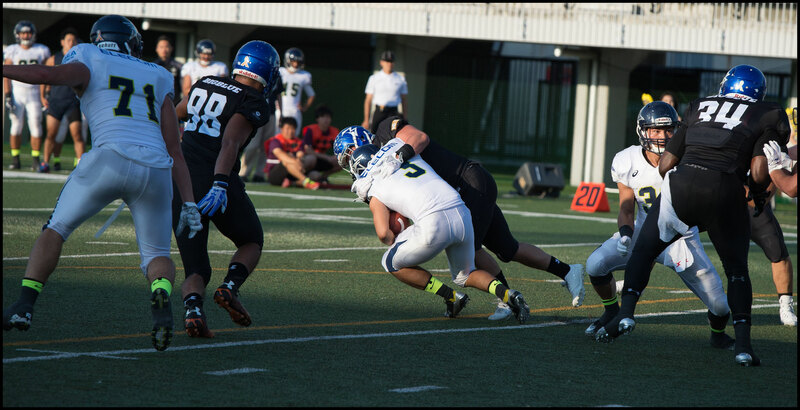 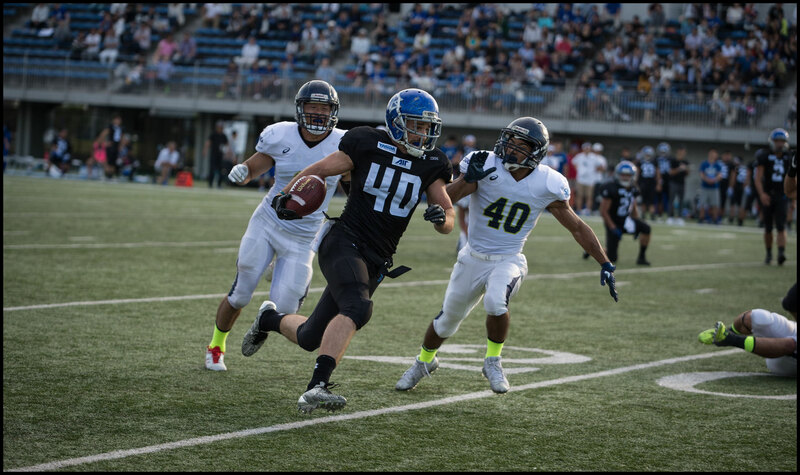 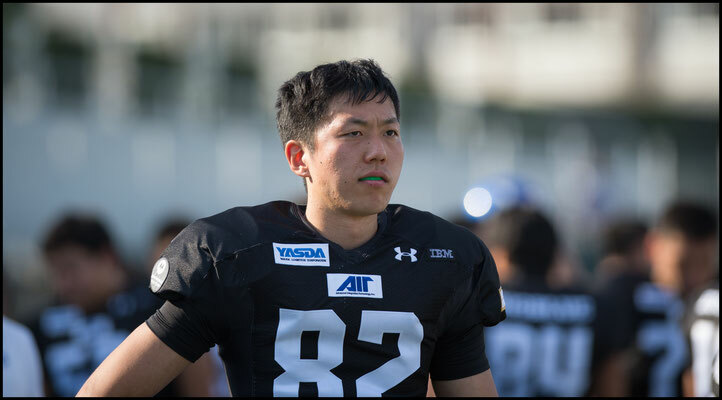 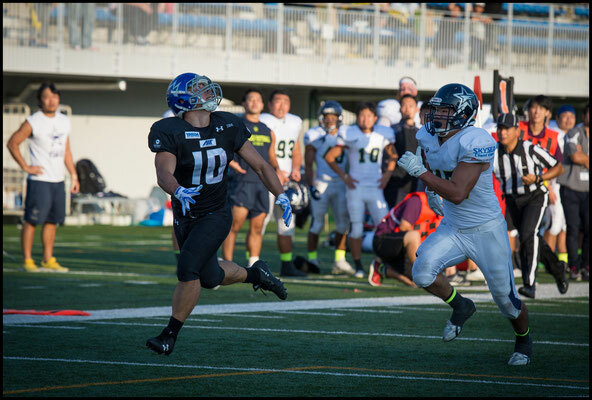 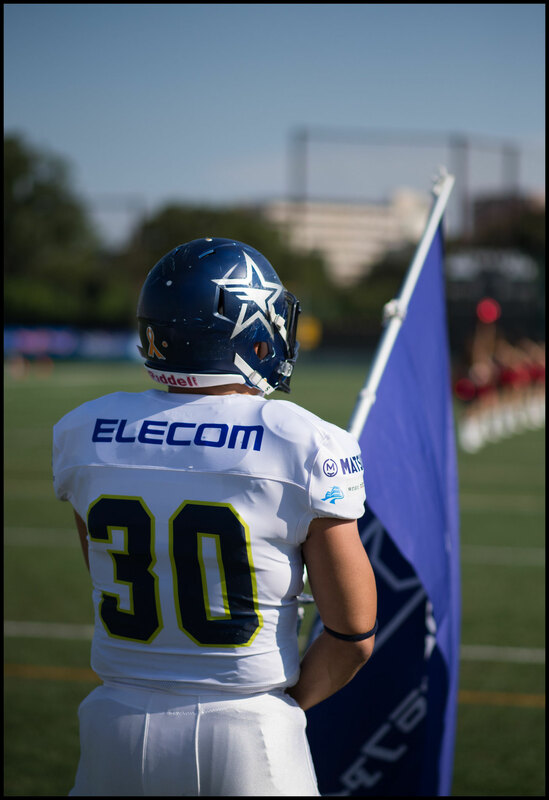 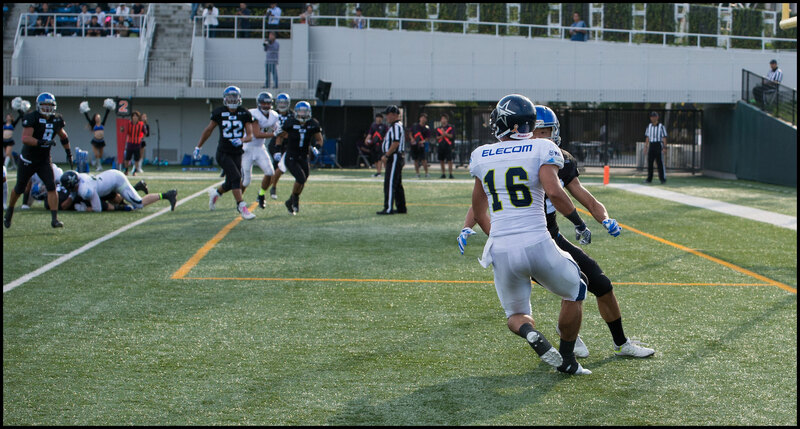 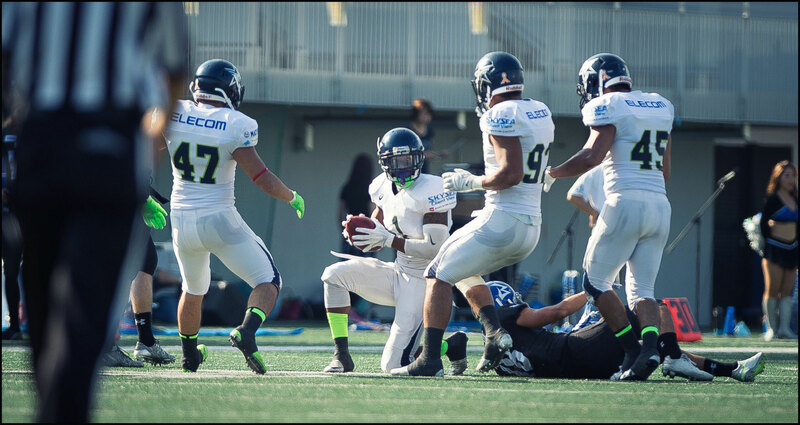 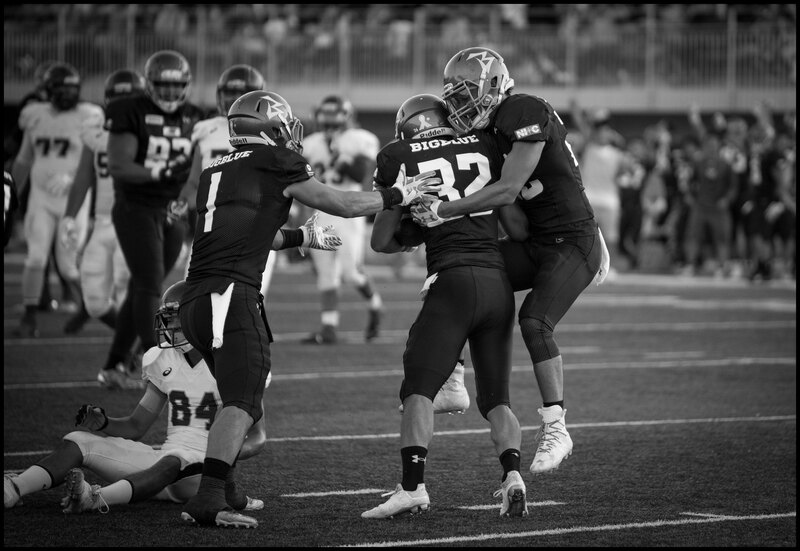 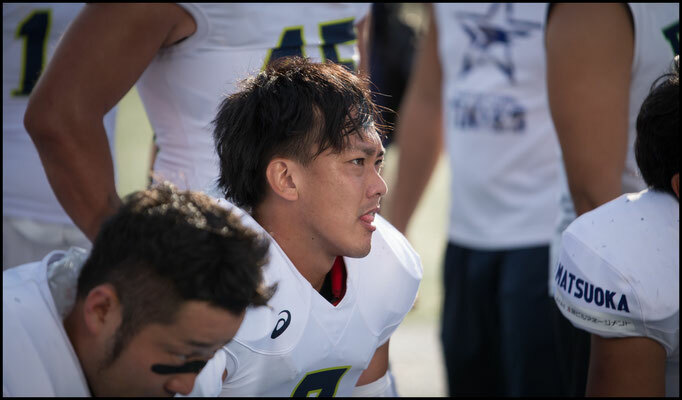 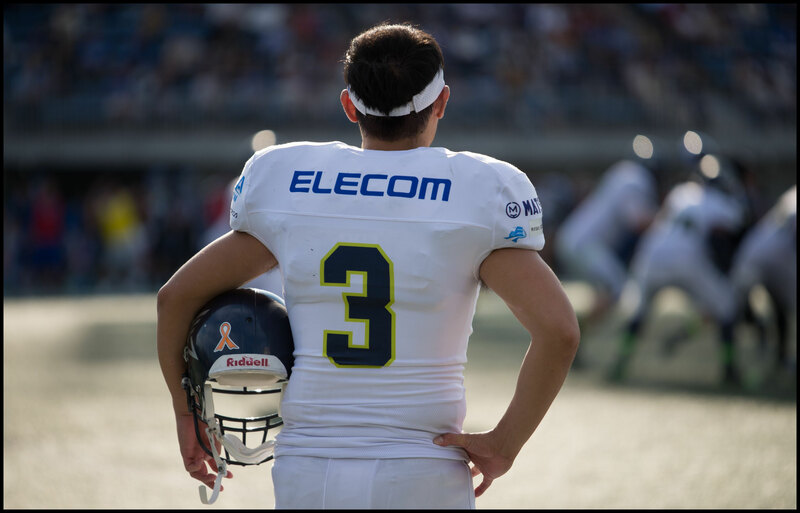 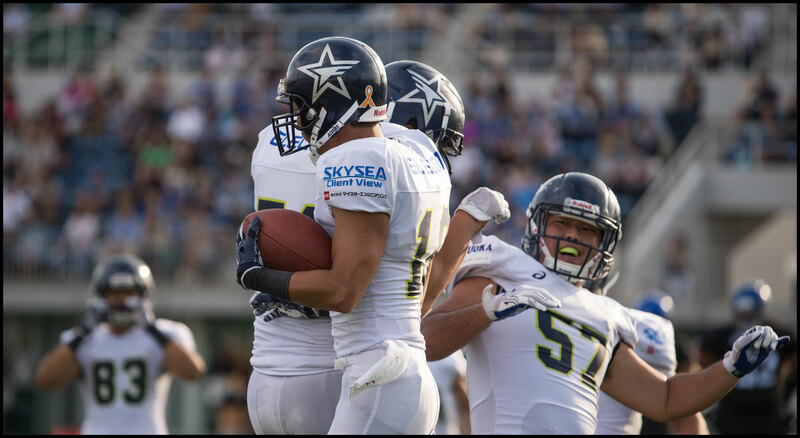 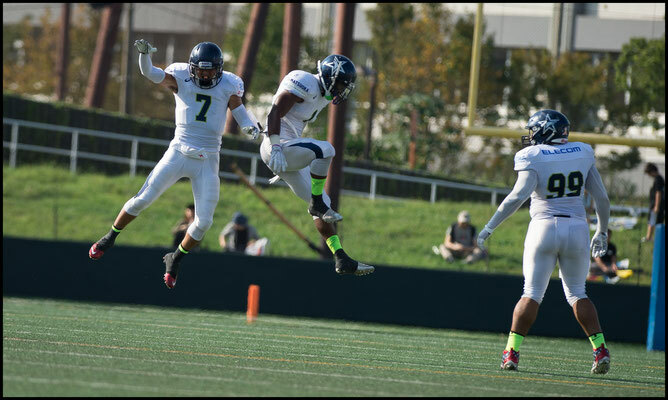 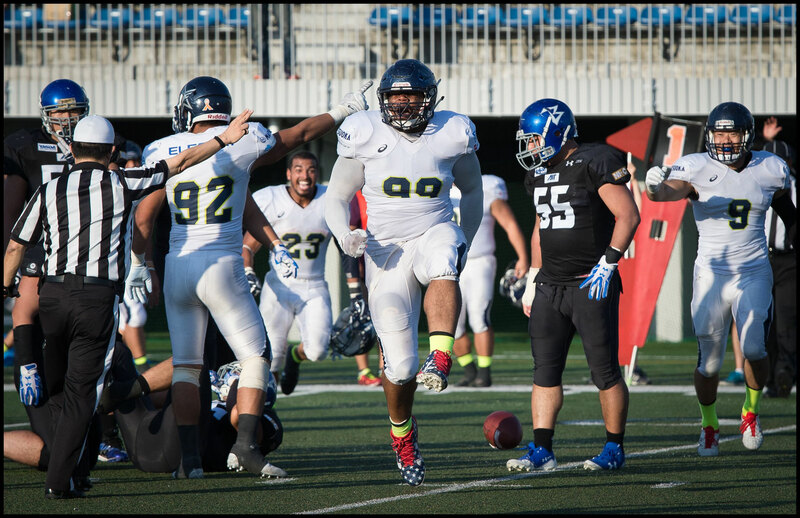 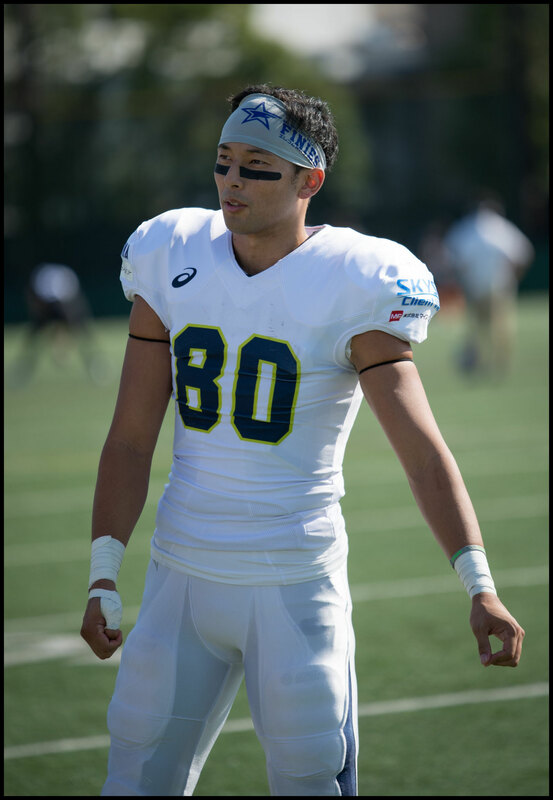 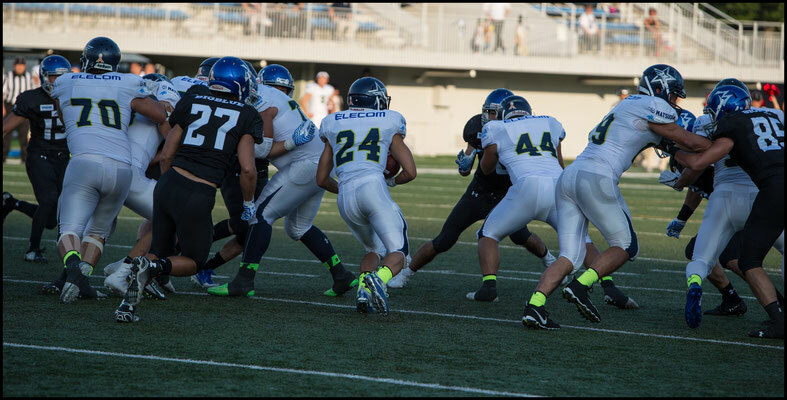 Midway through the third it was beginning to look like Kasuya's TD pass to wideout Shunsuke Wada would give Elecom a repeat of their 7-0 victory over Challengers in round three, when the same pair combined for that game's only score. 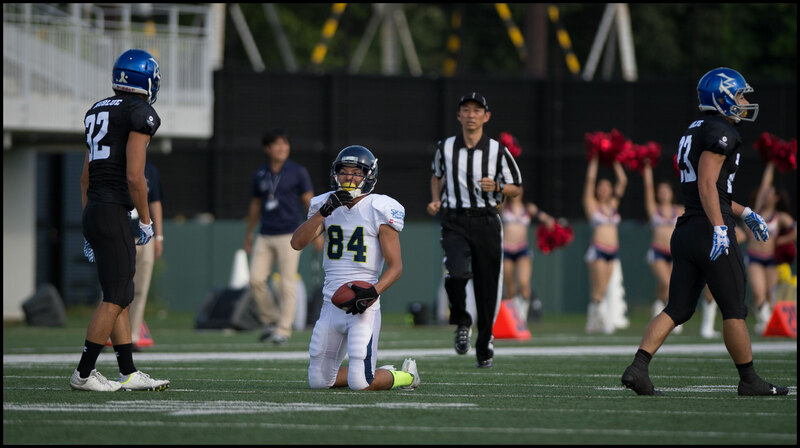 IBM though have multiple offensive threats and Tomokazu Sueyoshi finally made the breakthrough with an 11 yard TD reception with 11:08 left. 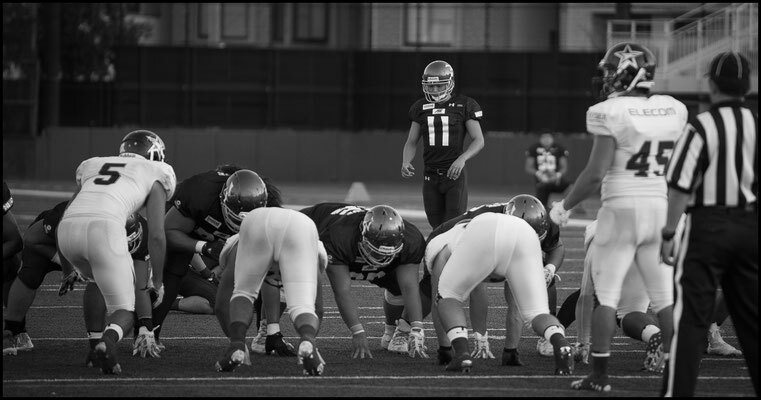 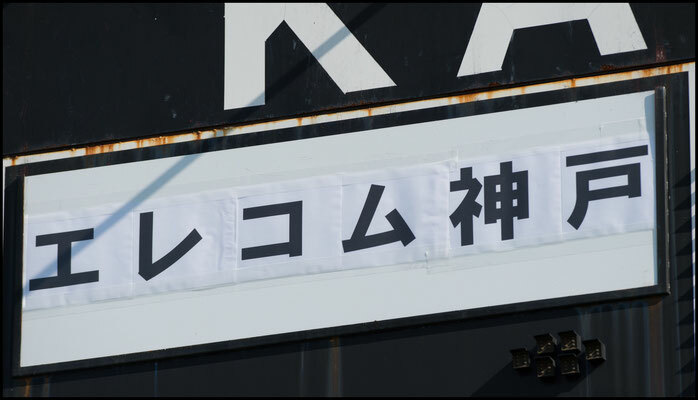 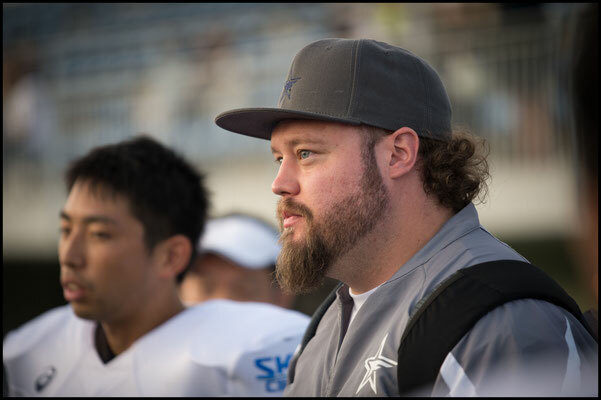 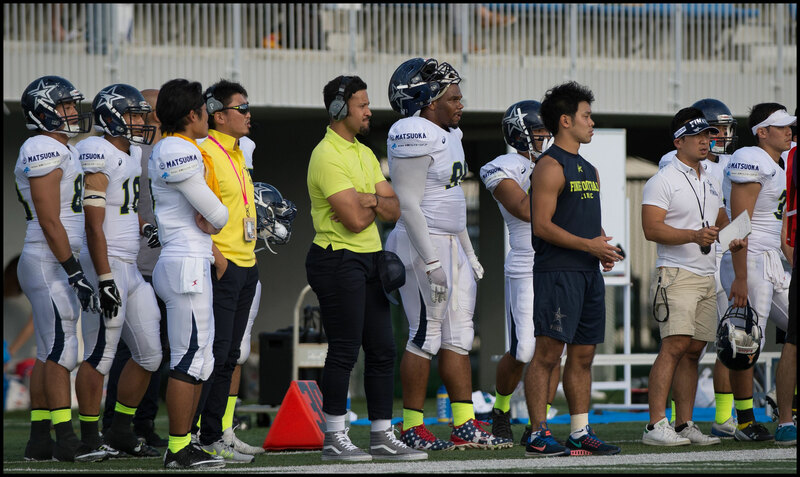 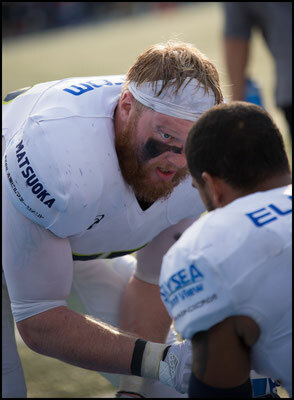 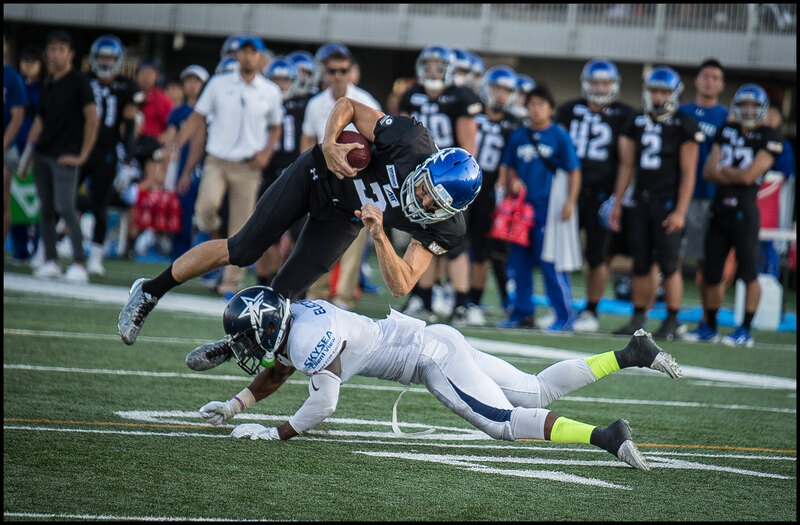 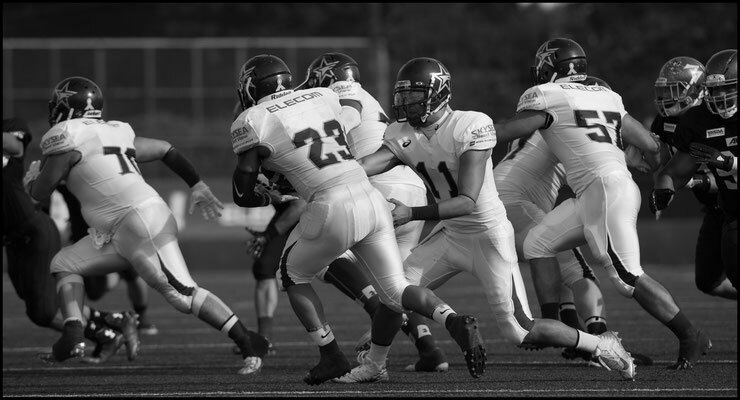 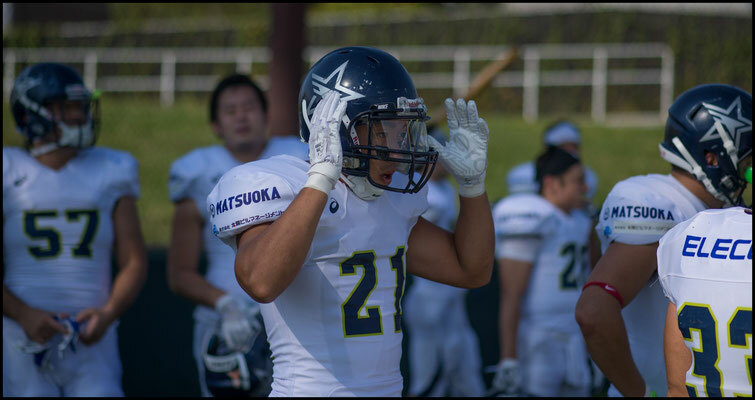 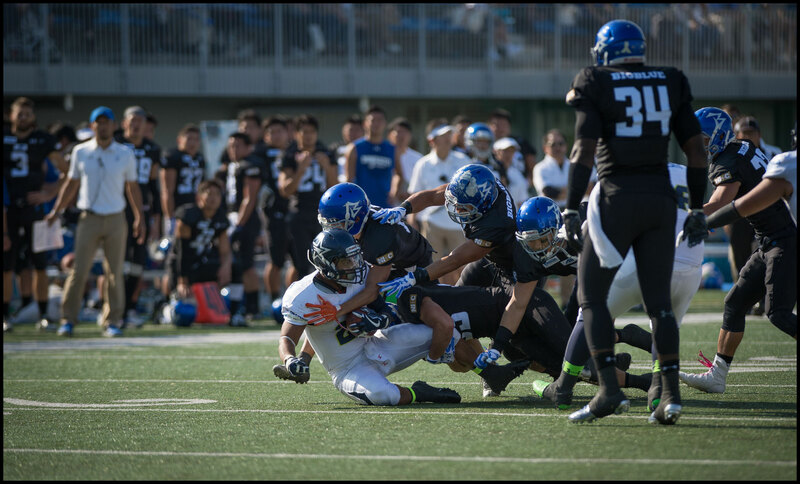 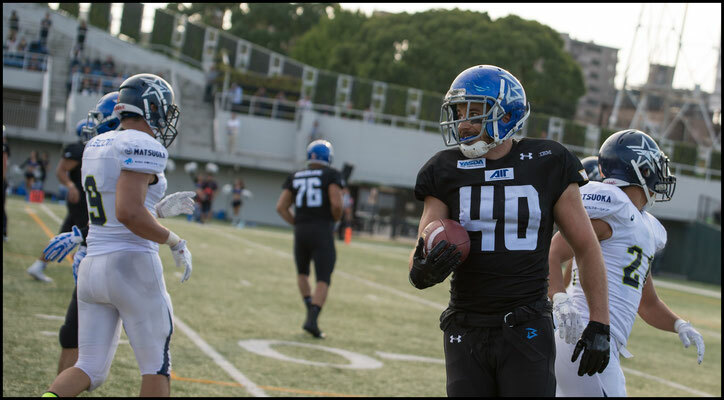 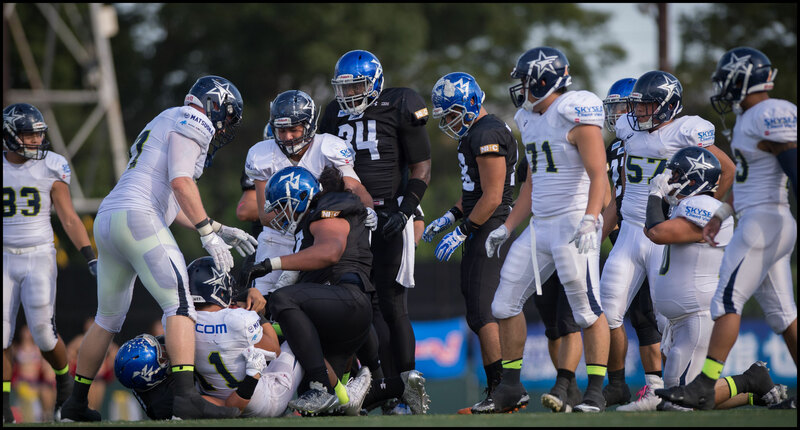 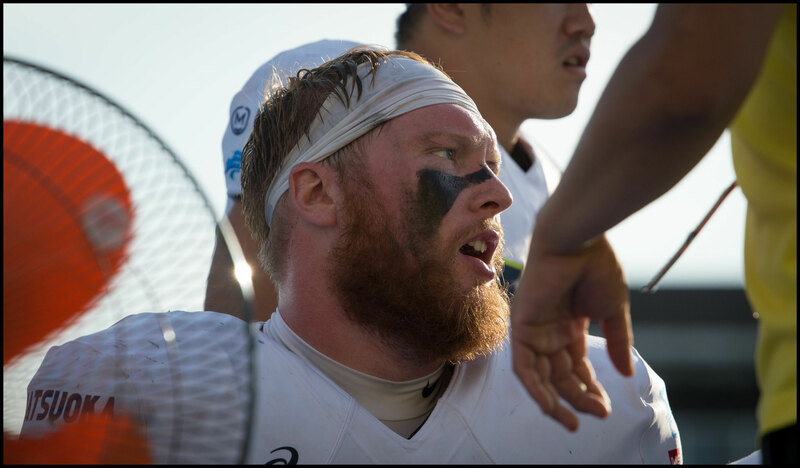 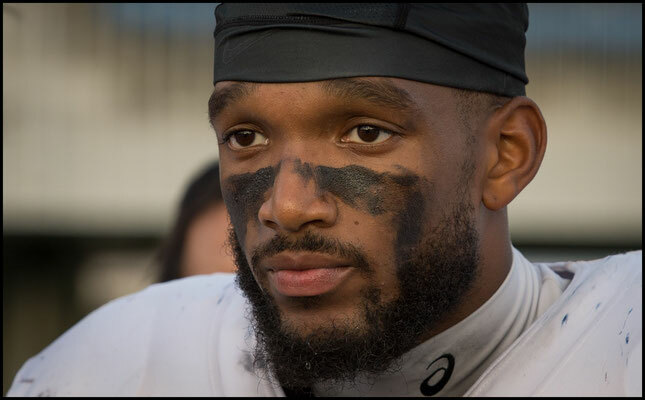 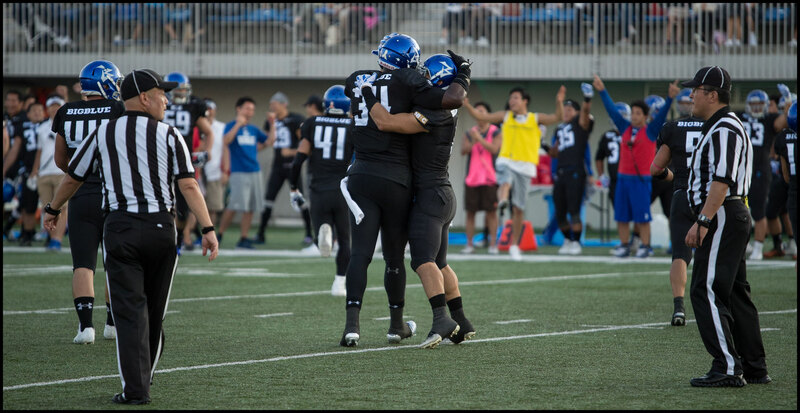 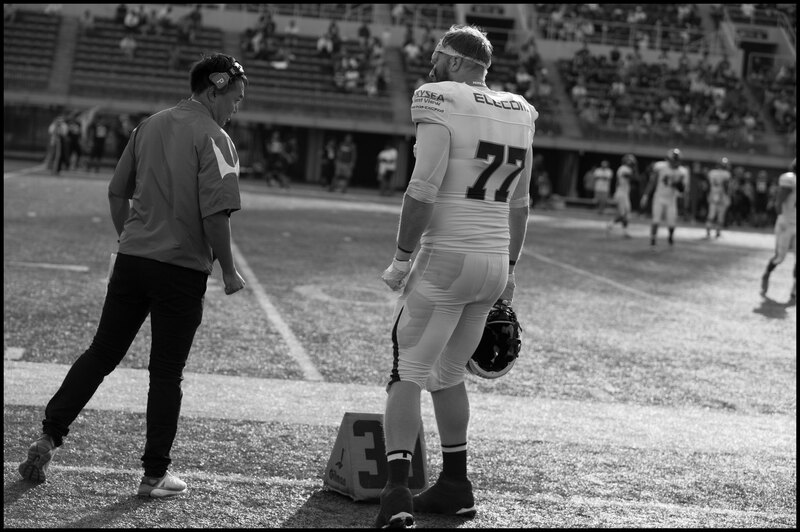 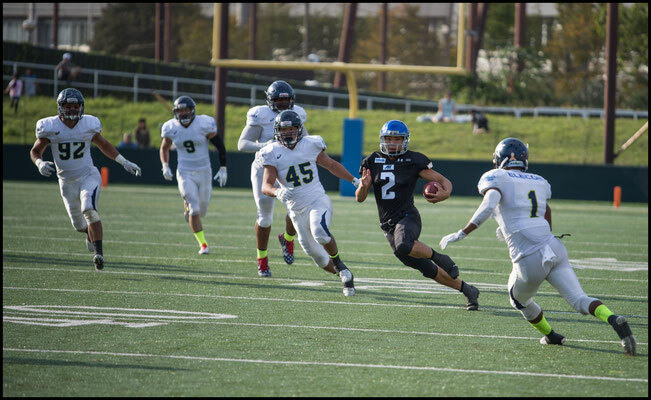 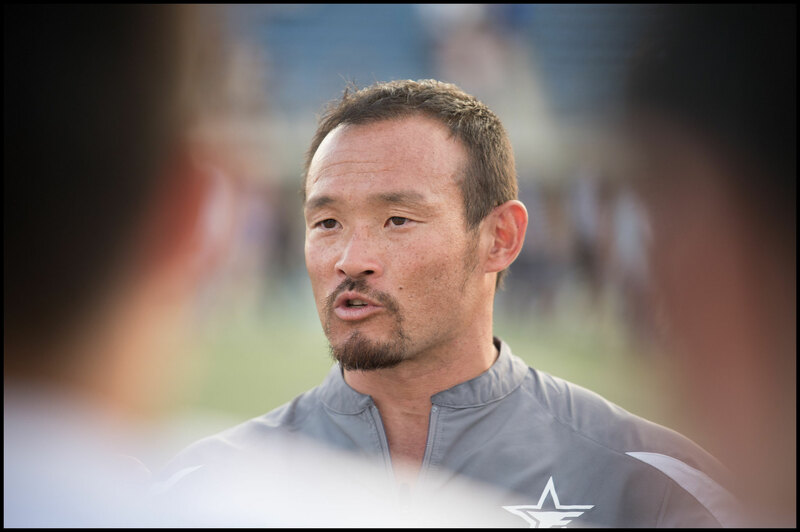 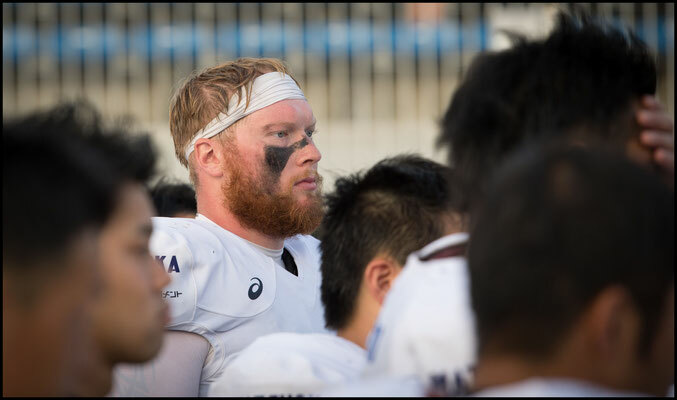 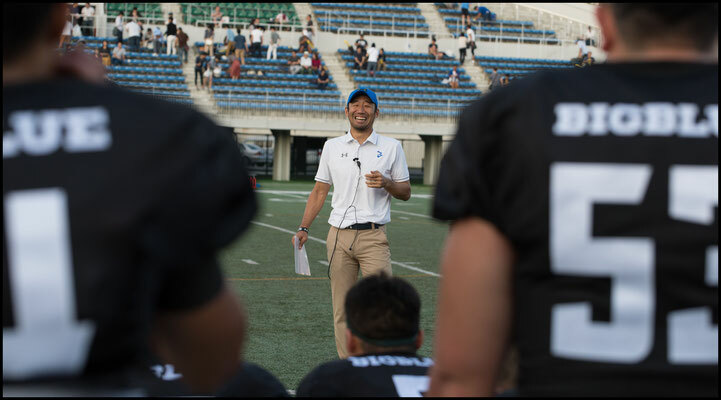 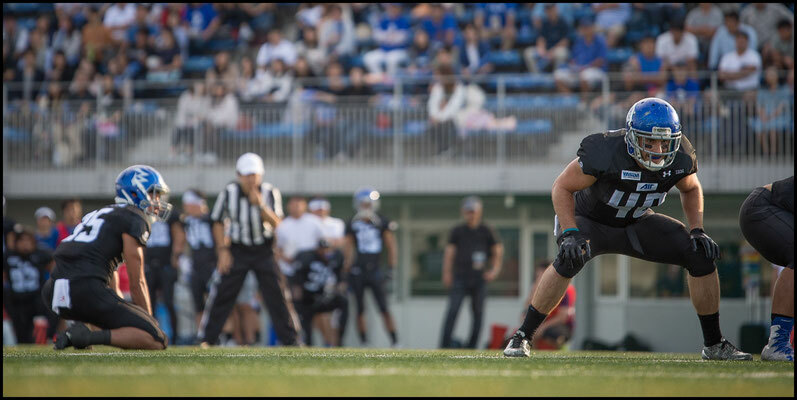 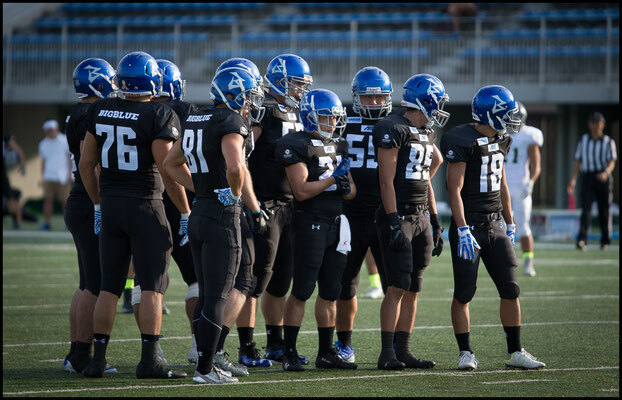 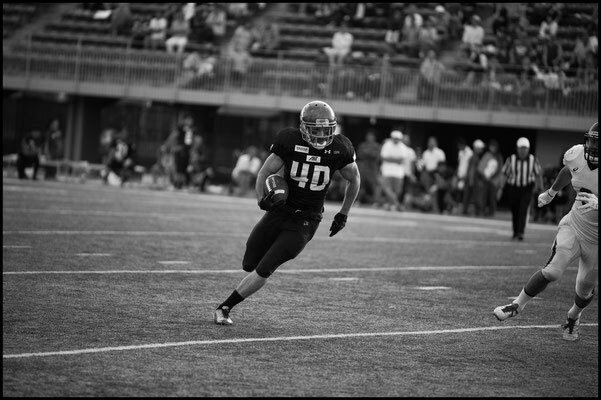 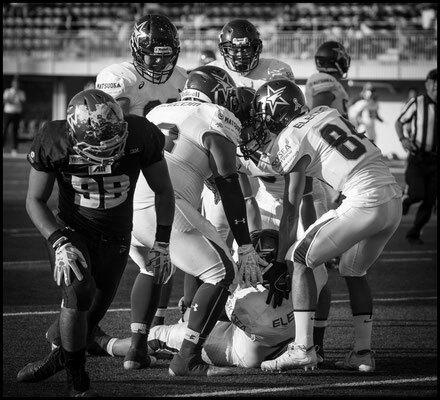 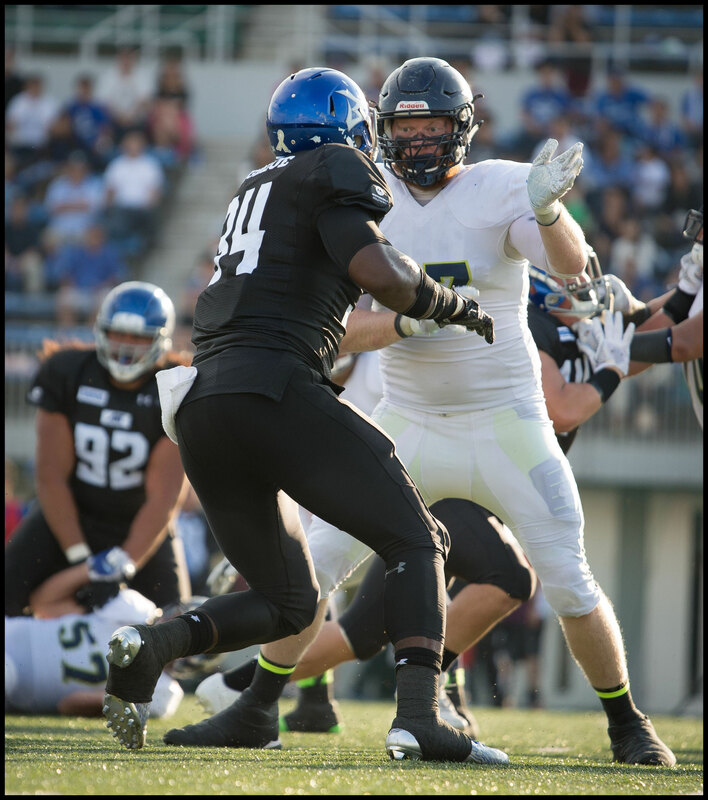 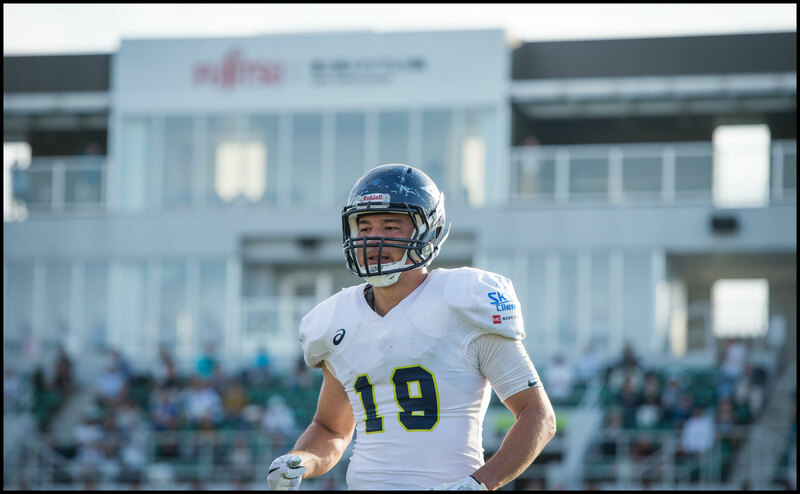 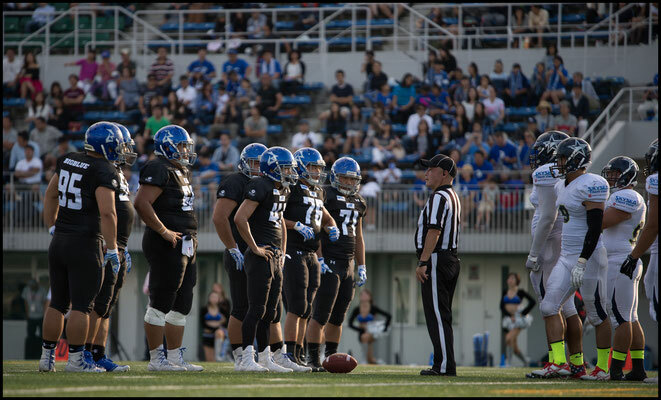 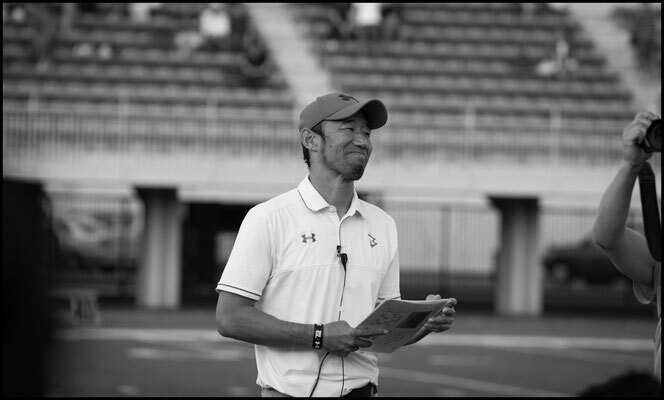 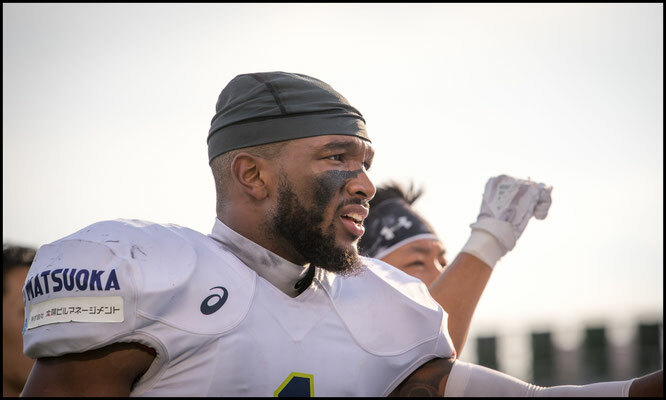 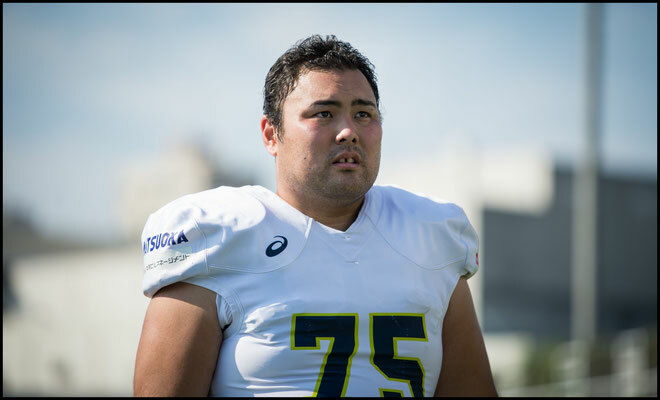 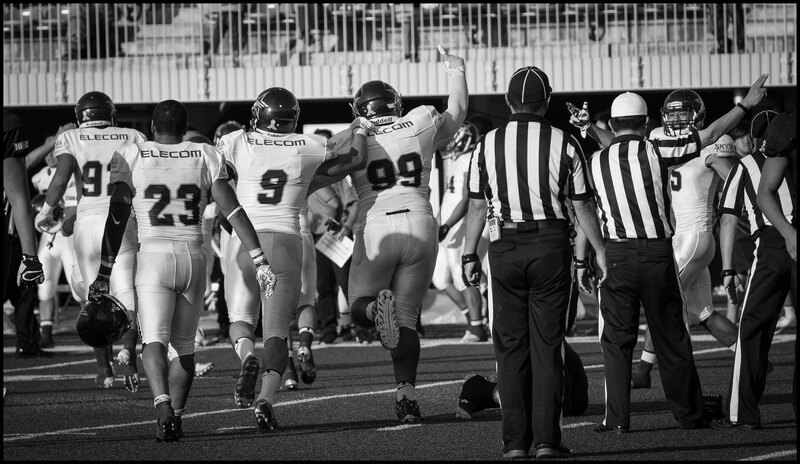 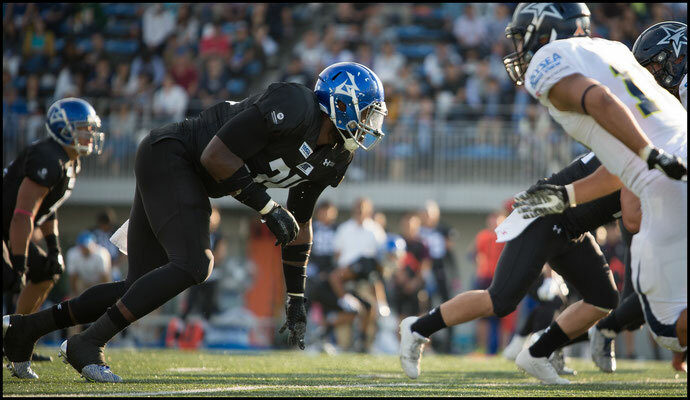 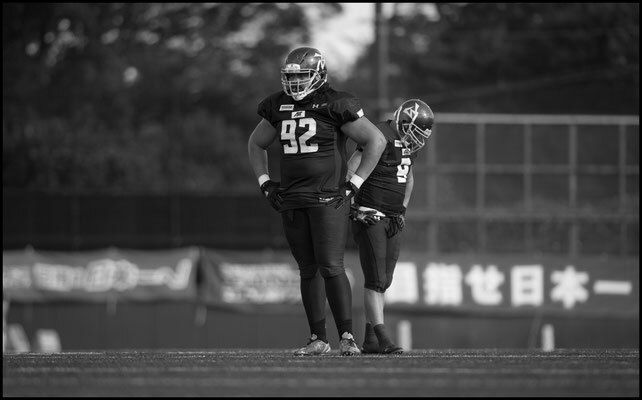 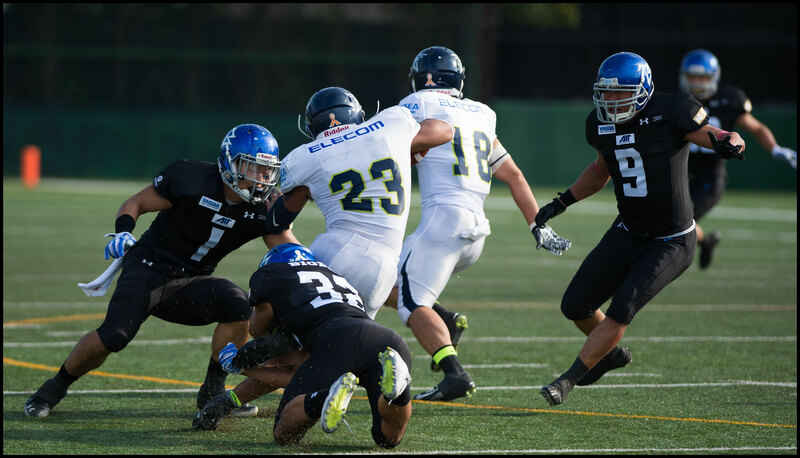 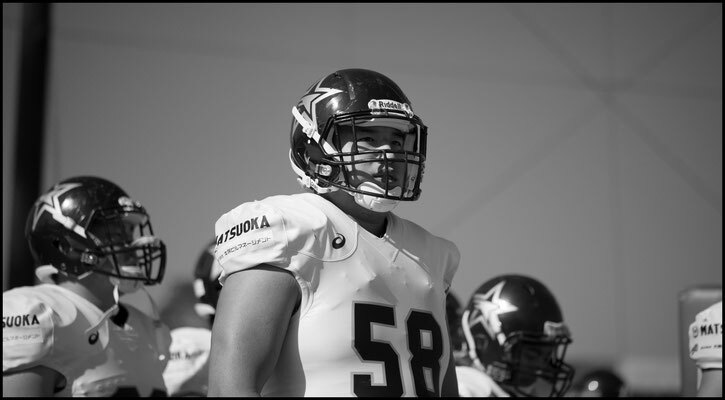 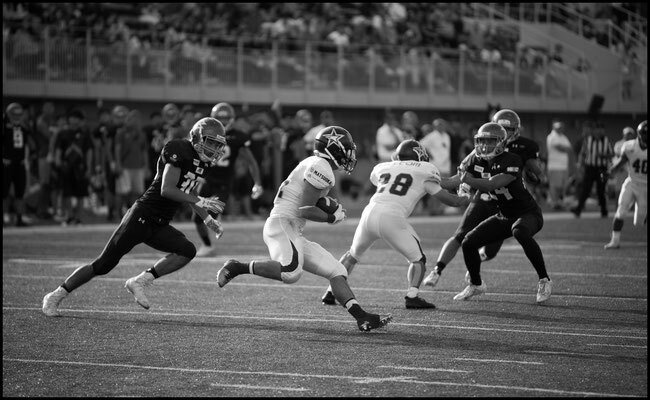 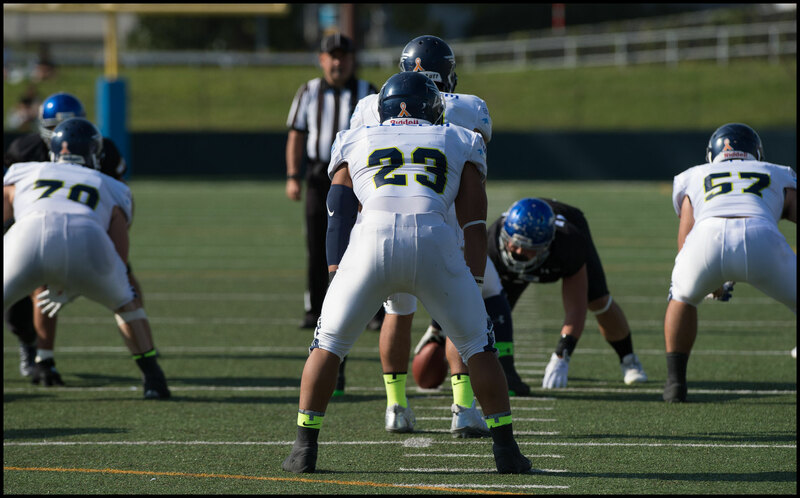 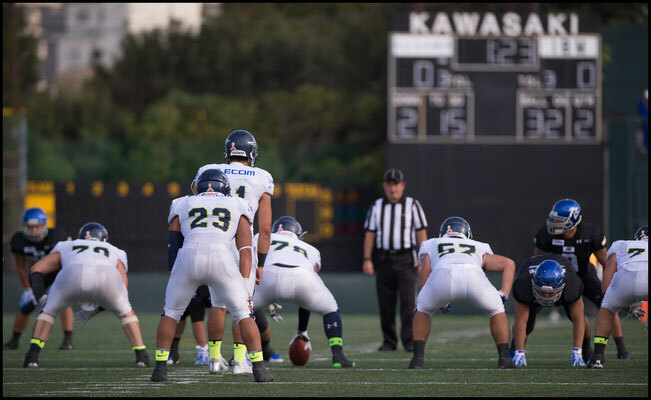 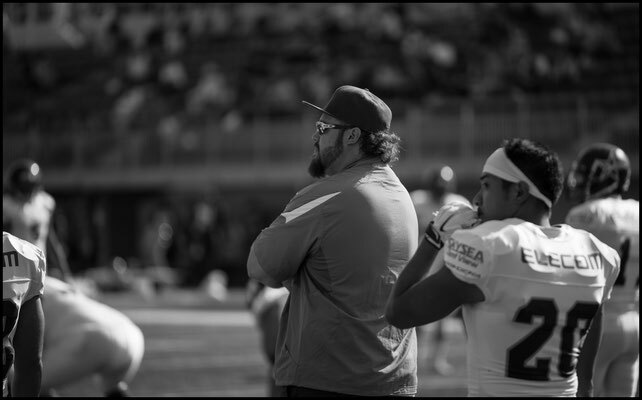 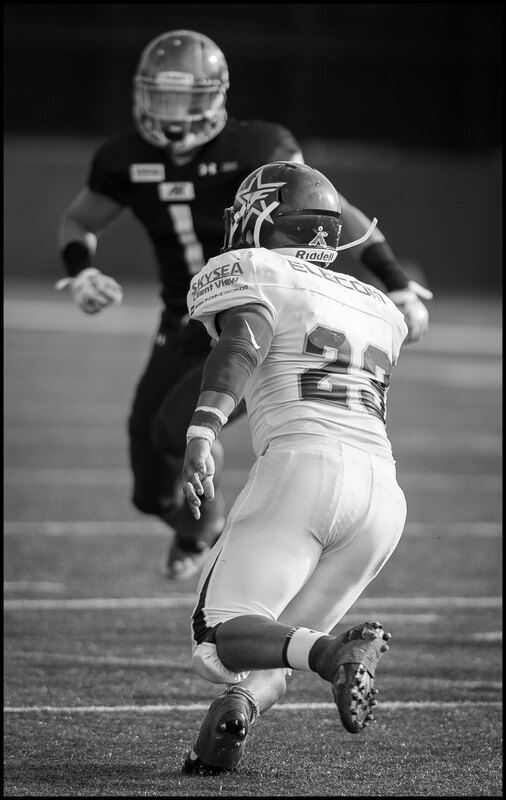 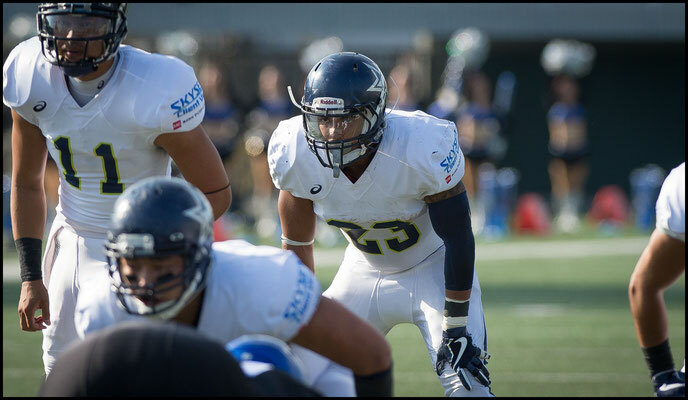 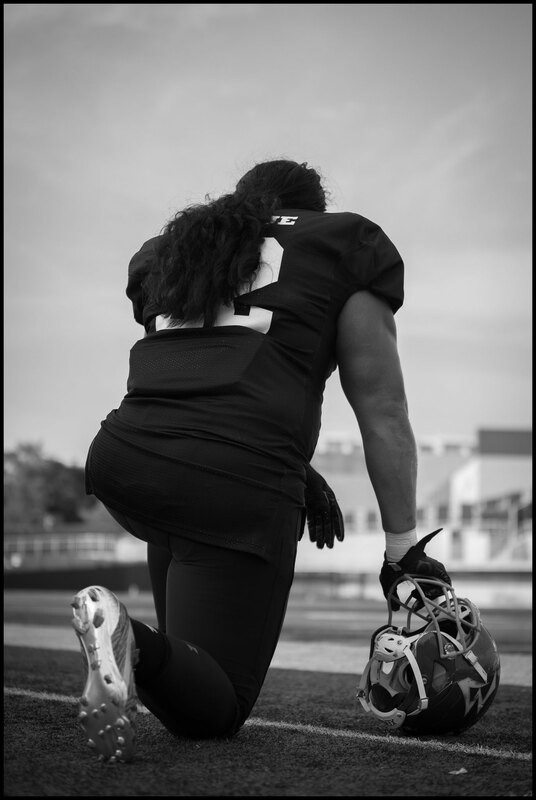 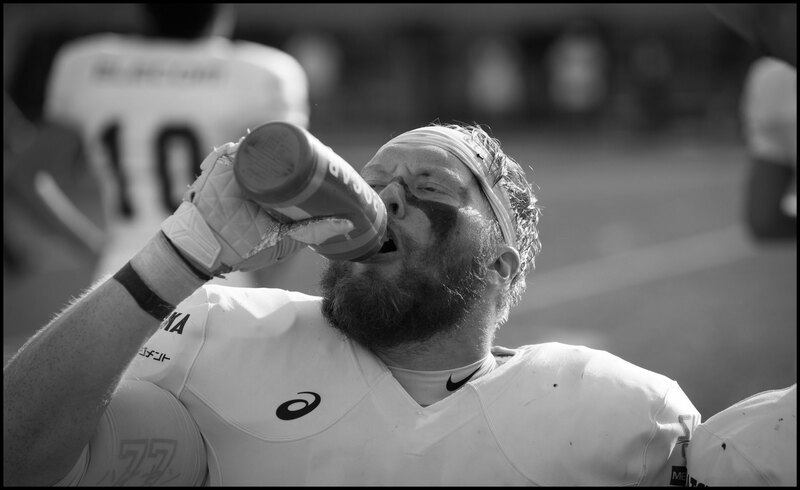 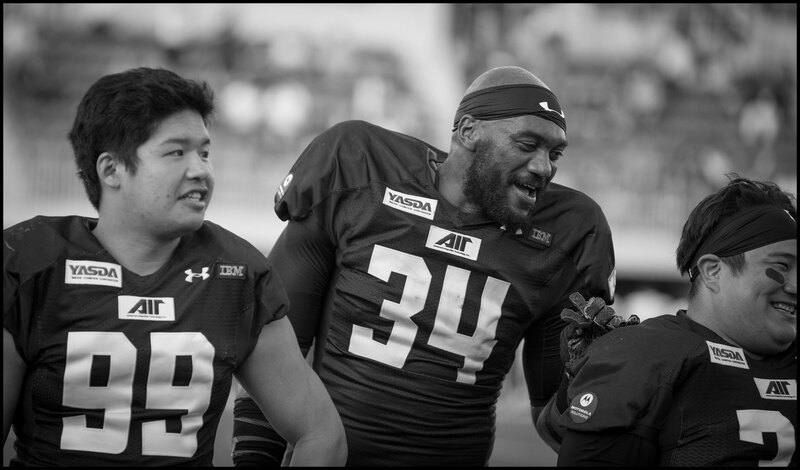 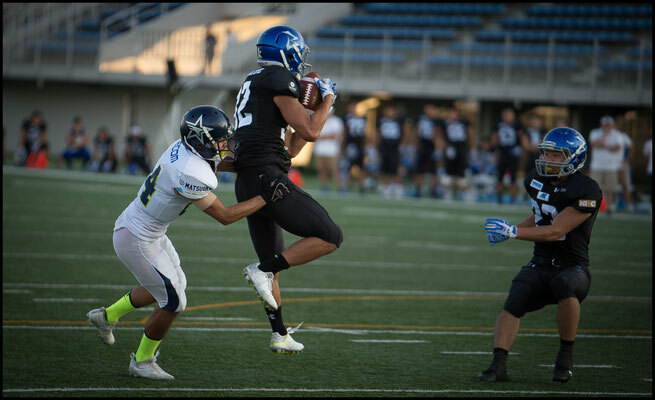 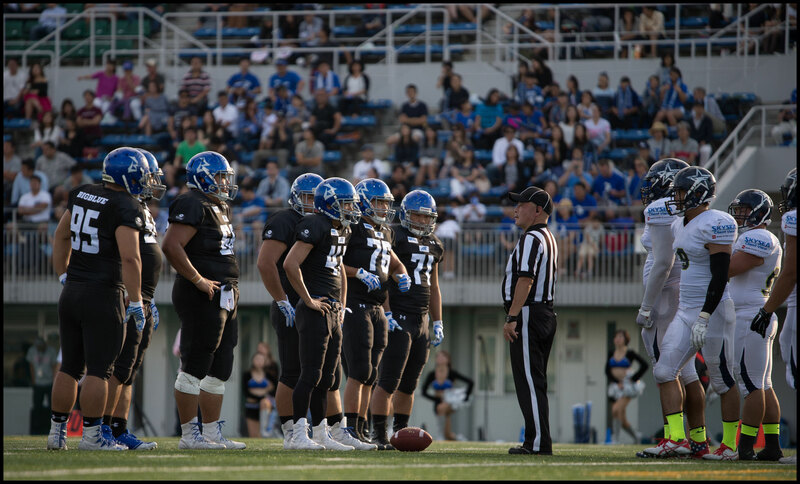 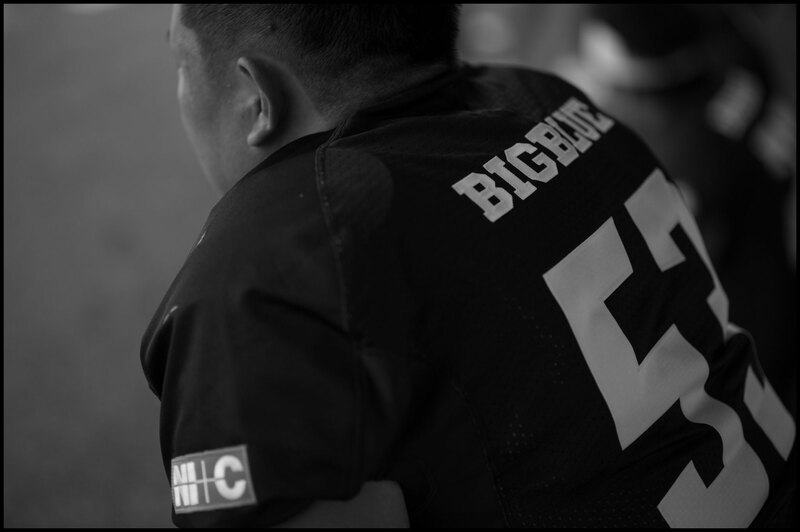 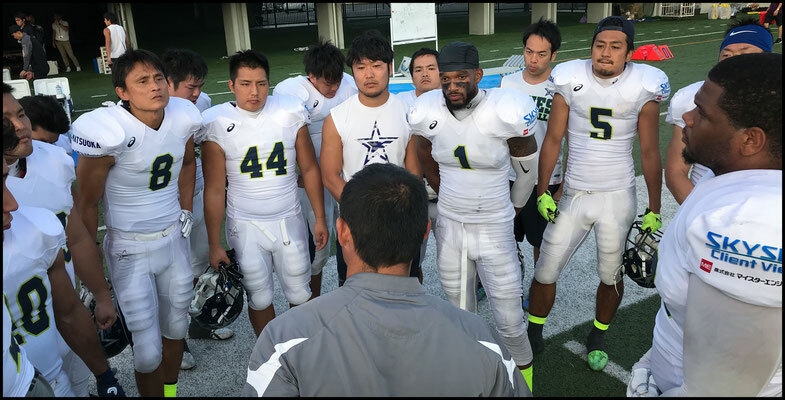 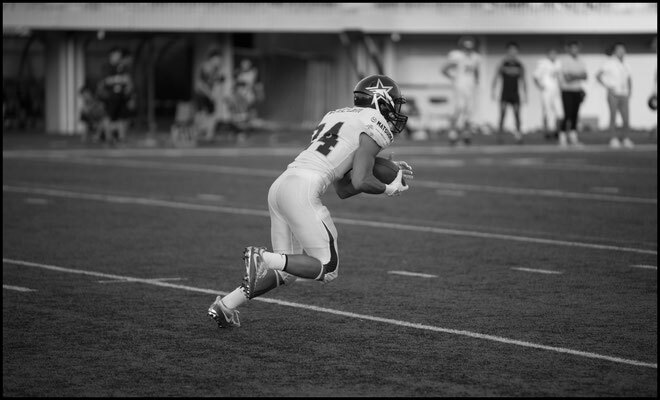 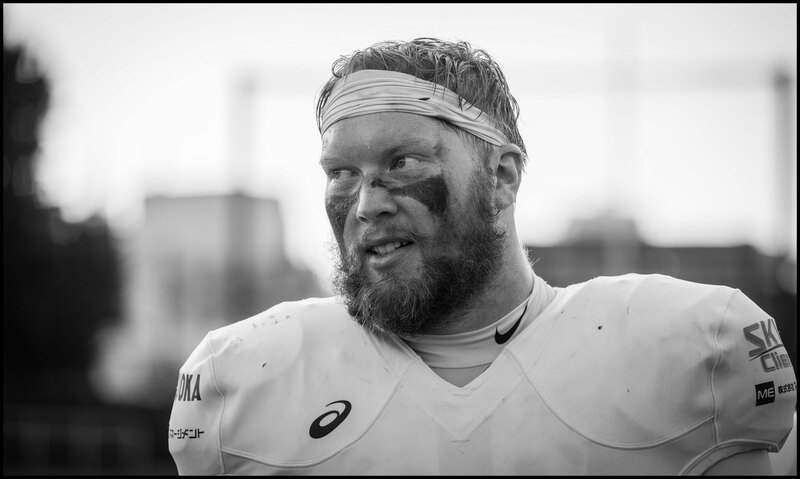 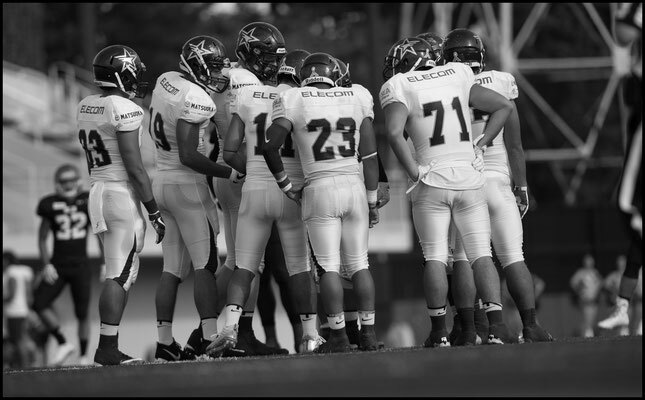 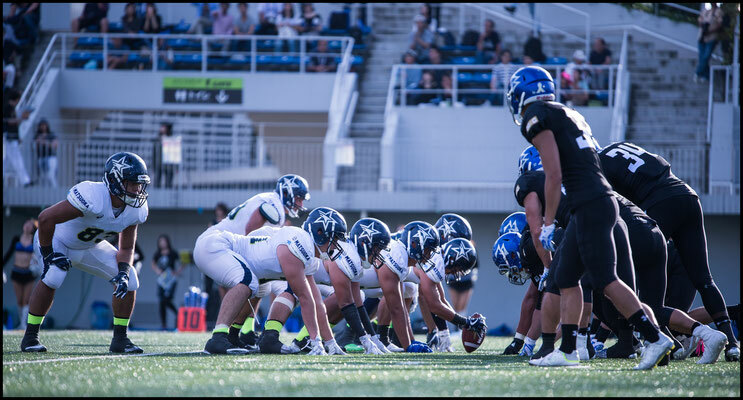 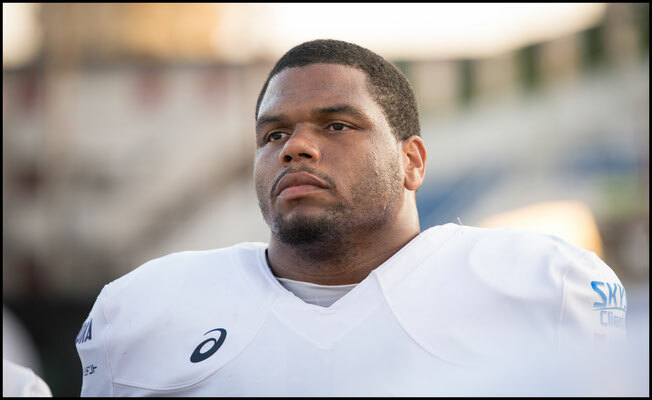 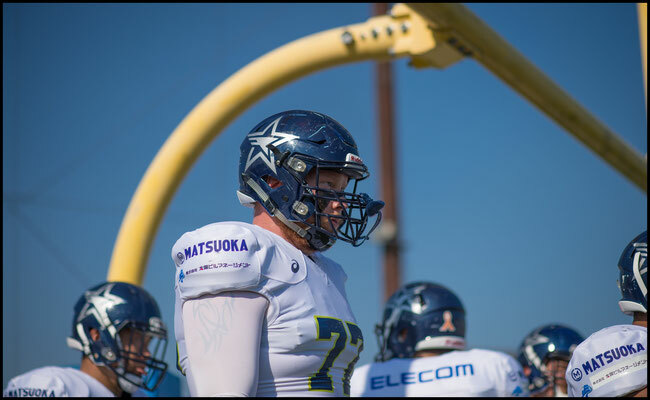 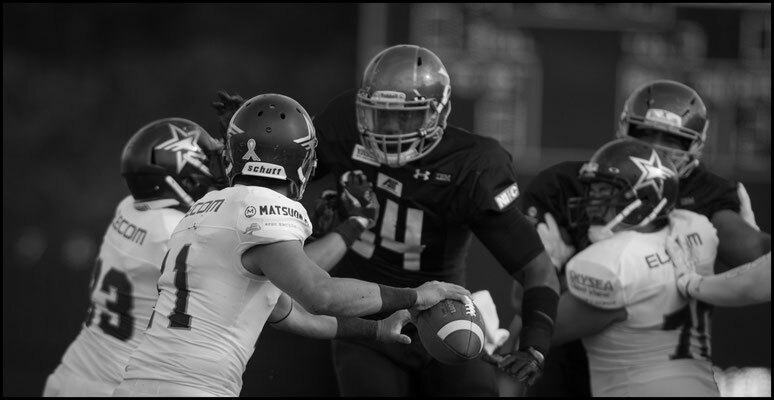 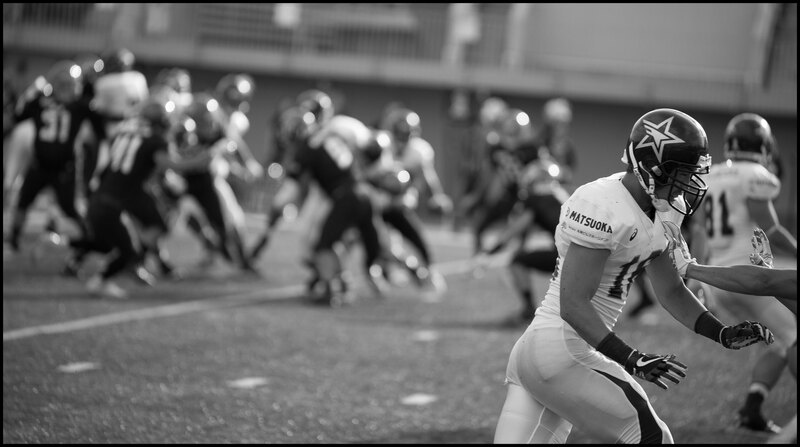 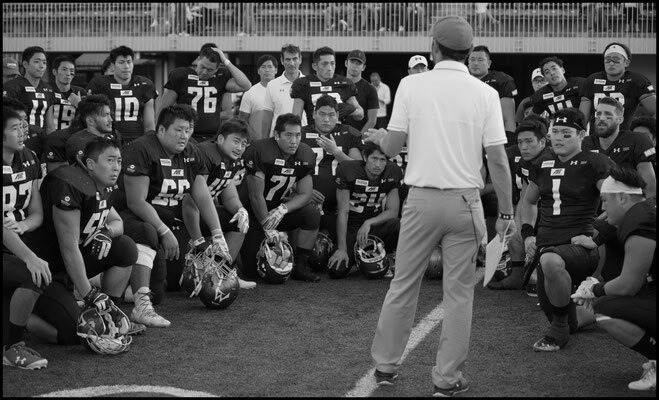 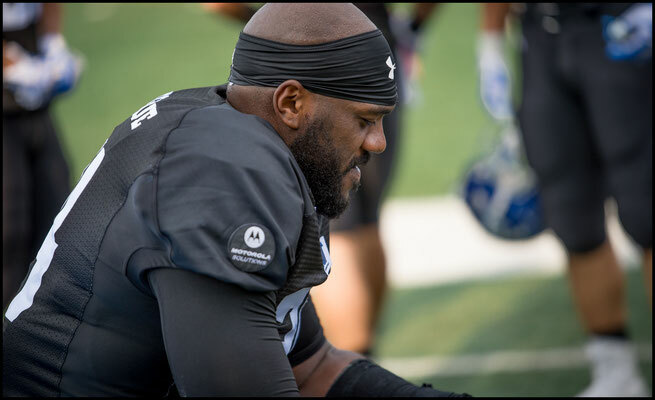 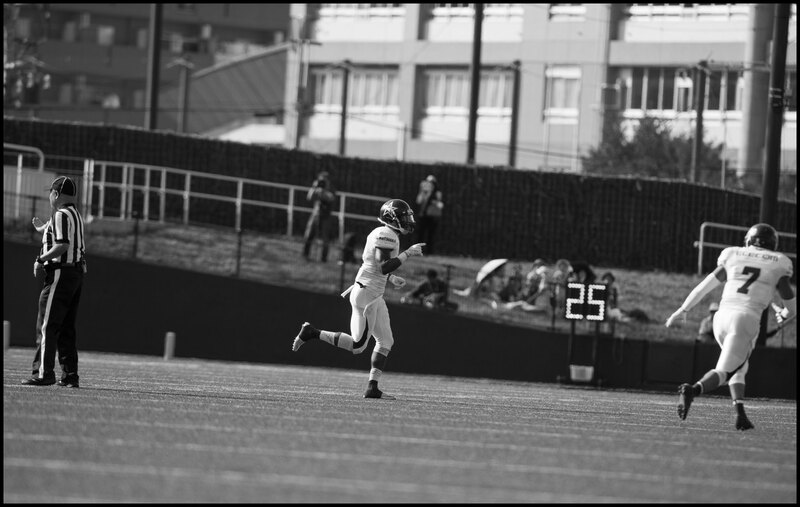 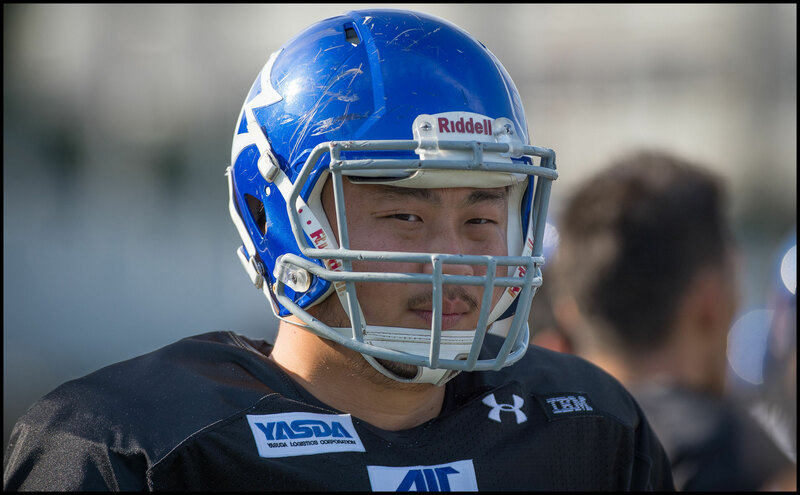 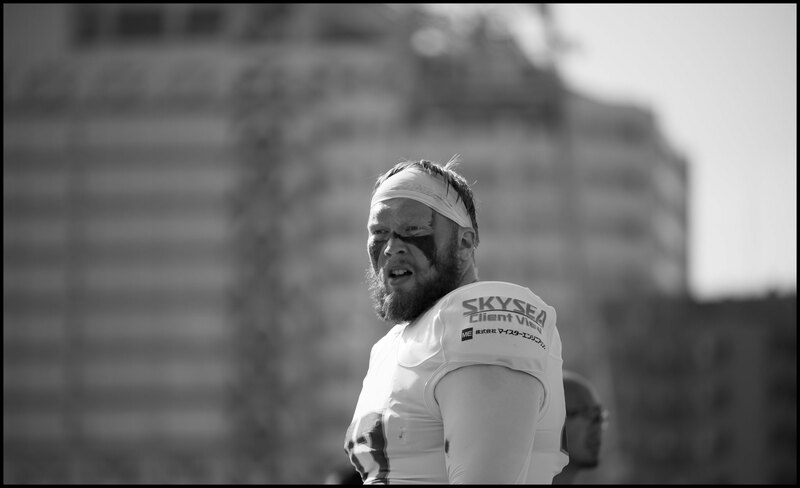 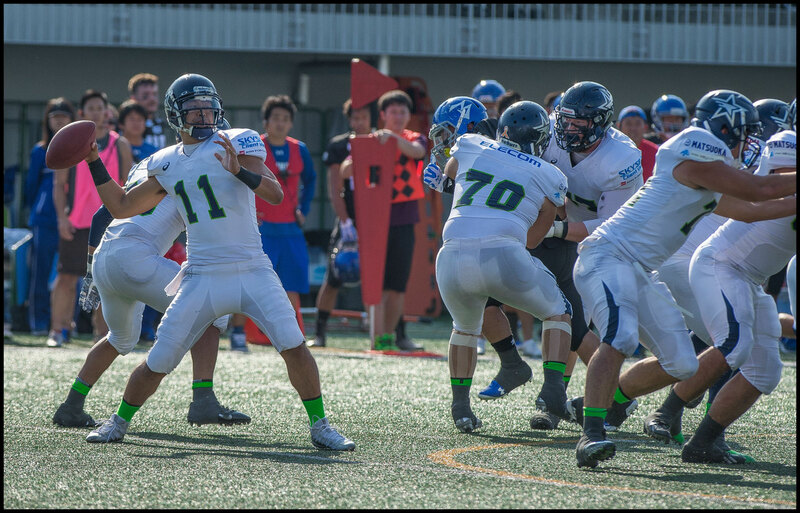 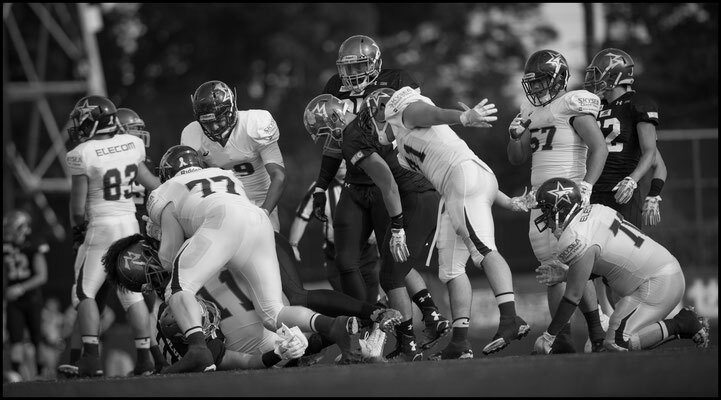 It's a sign though of how far this Finies defense has come that they held an IBM side that put up 42 points on Nojima the week before scoreless until the fourth quarter. Big Blue started the game resembling a Bizarro World Tokyo Gas passing on it's first six plays. The drive stalled at their own 43 though and they were forced to punt. 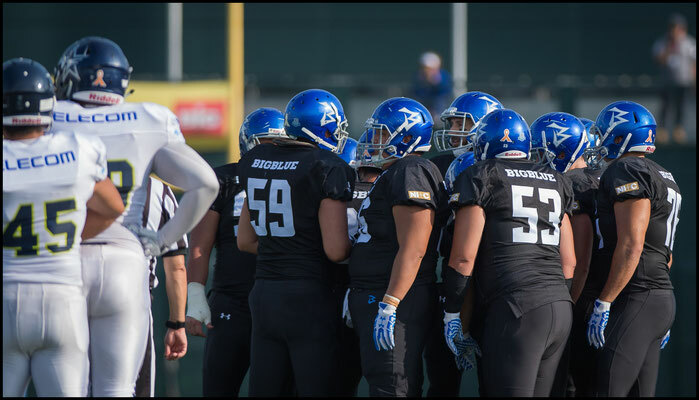 Neither team could get anything going in the first half as the defenses locked things down. 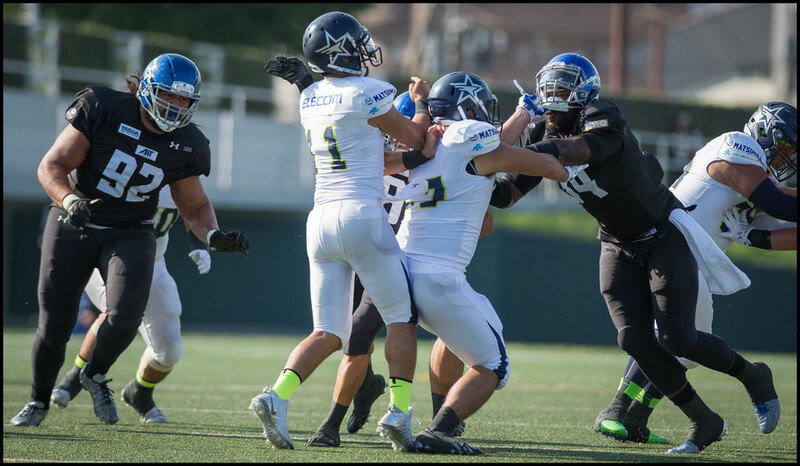 Sean Draper picked off a pass for Elecom and IBM's D-Line pressure didn't allow Kasuya time in the pocket, or give Jordan Canzeri lanes in which to run. 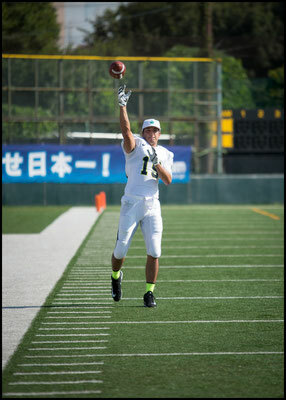 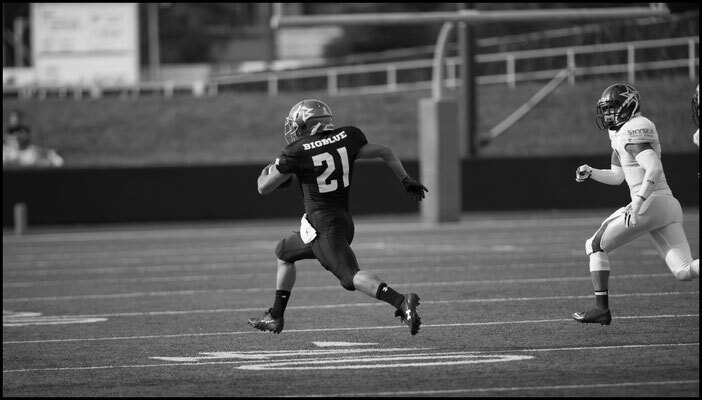 Canzeri averaged 3.9 yards on the day but apart from two gains of about 25 yards he was held to under 2.5 yards a clip. 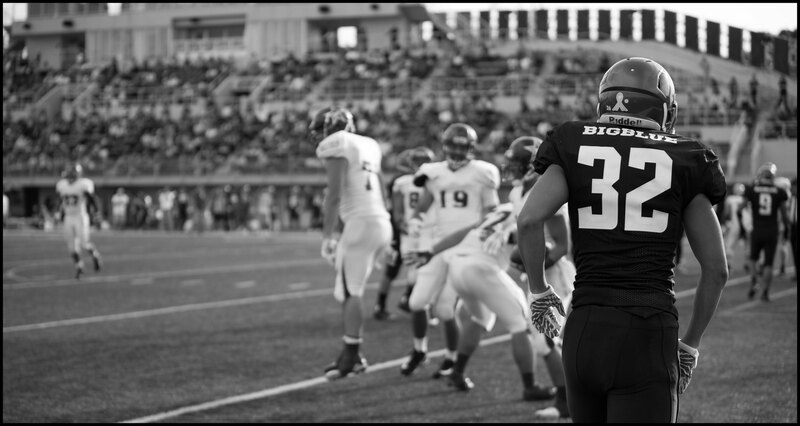 That didn't mean former Iowa Hawkeye wasn't featured heavily though carrying the ball 30 times. On the other side of the ball DB Draper was his usual effective self breaking up a couple of passes in addition to the interception. 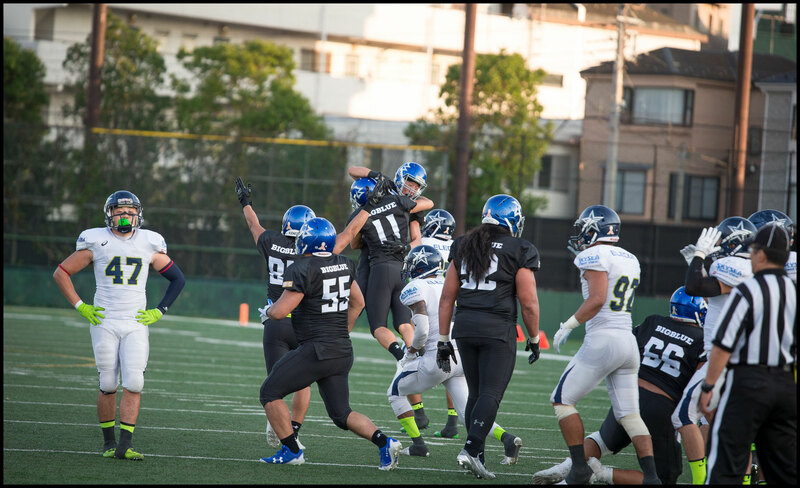 He showed his jumping ability on one play early getting up and tipping a ball that would otherwise have led to a deep completion down the right sideline and almost picking off another pass. 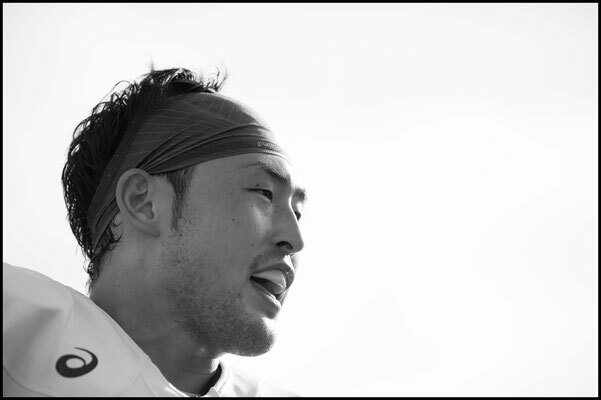 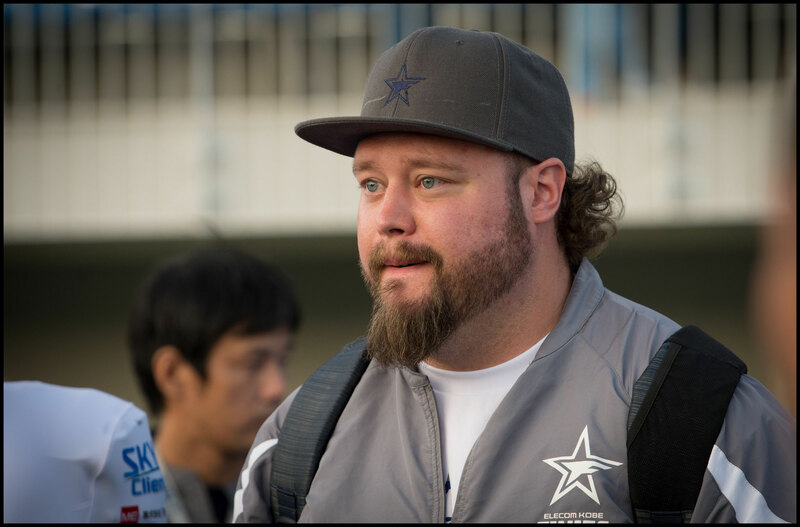 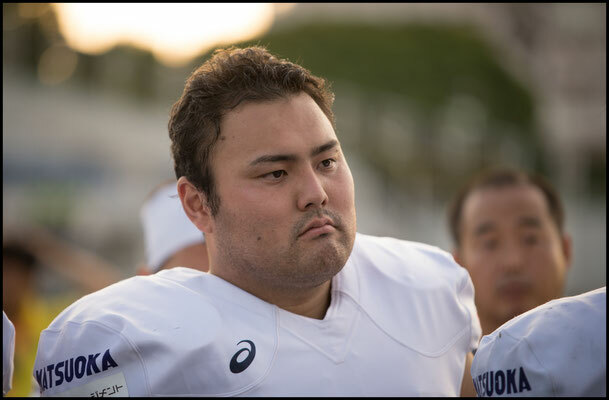 Draper also blew up Ryo Takagi on the second half opening kickoff. The edge that this Kobe team plays with is noticeable. 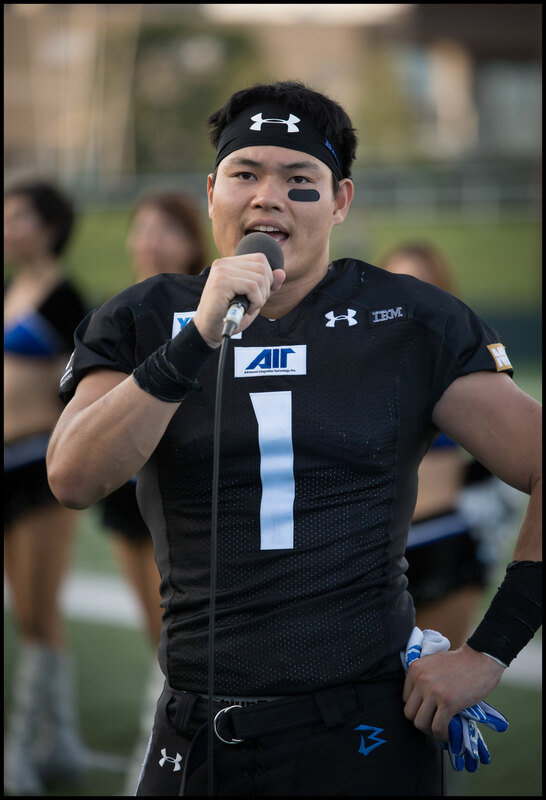 Rookie DL Alex Pace had a tackle for loss and in the second quarter on a third down he laid a hit on Sueyoshi that could be heard at the top of the stands. 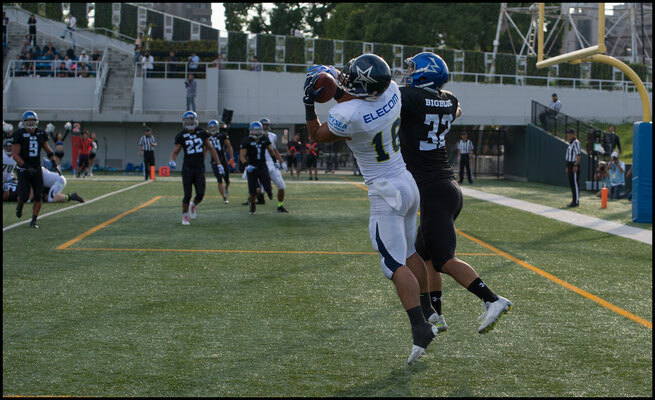 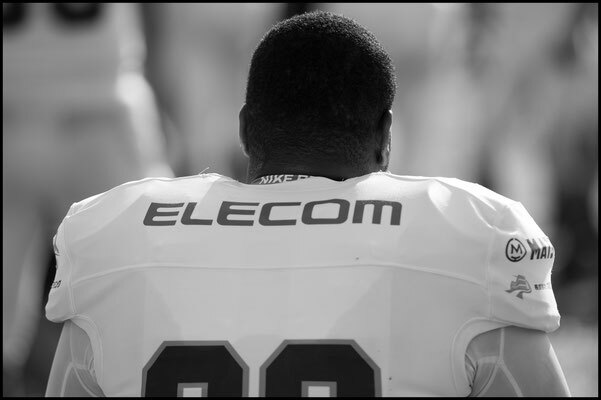 Late on, Pace recovered a fumble late that looked at the time like it might have sealed the game for Elecom. 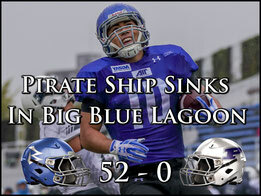 That wasn't to be however. 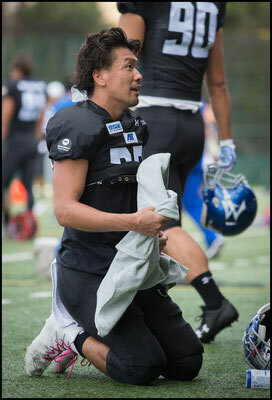 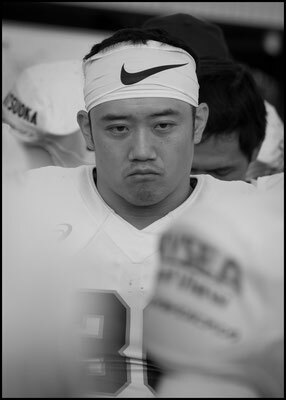 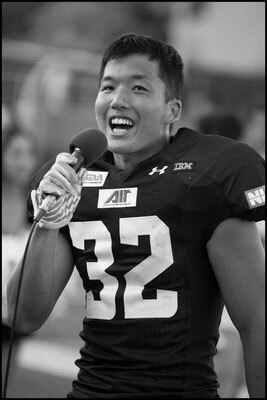 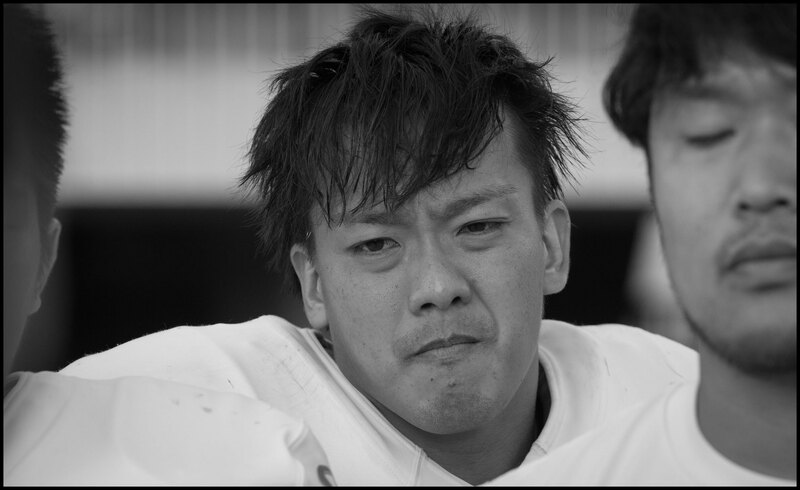 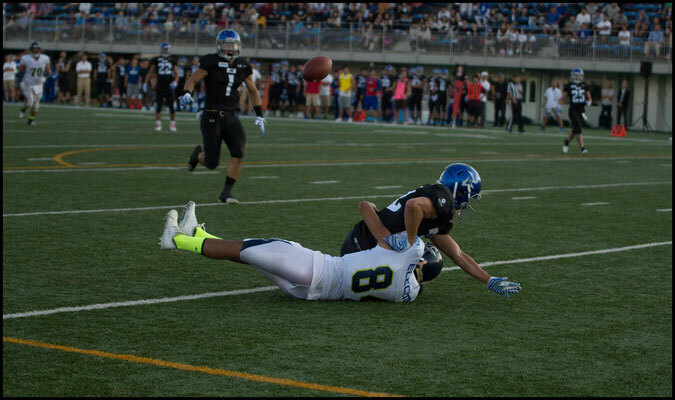 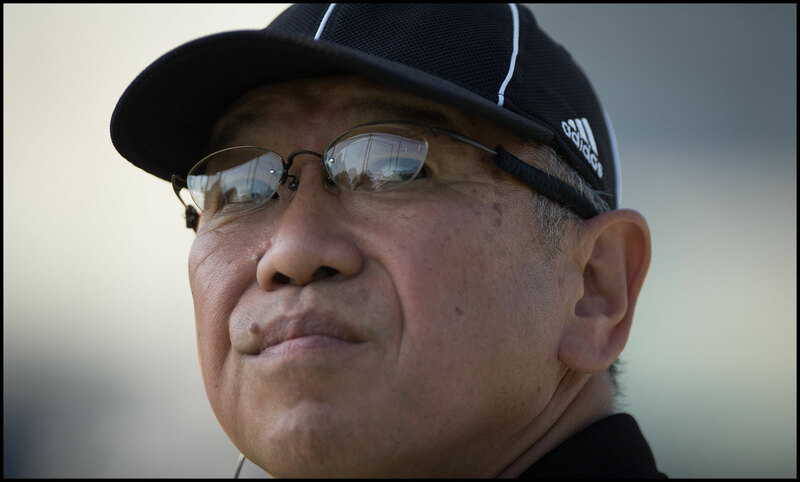 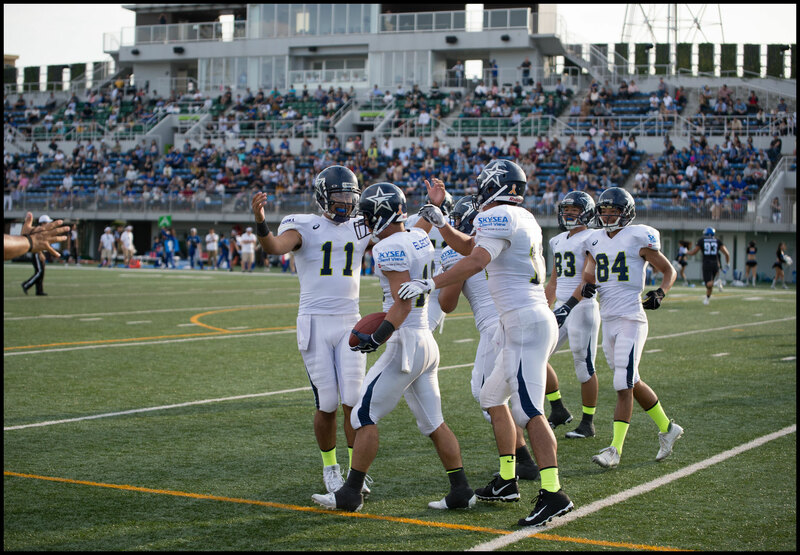 Kaoru Furukawa was overthrown in the endzone on third down and a fourth and goal pass also fell incomplete. 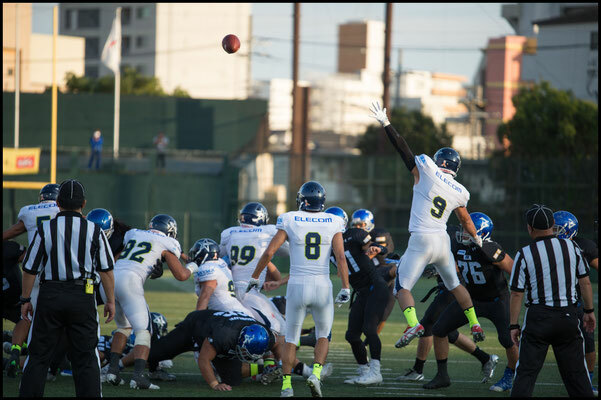 It was a brave to go for it though as a field goal at that point would have left Big Blue needing a TD to win. 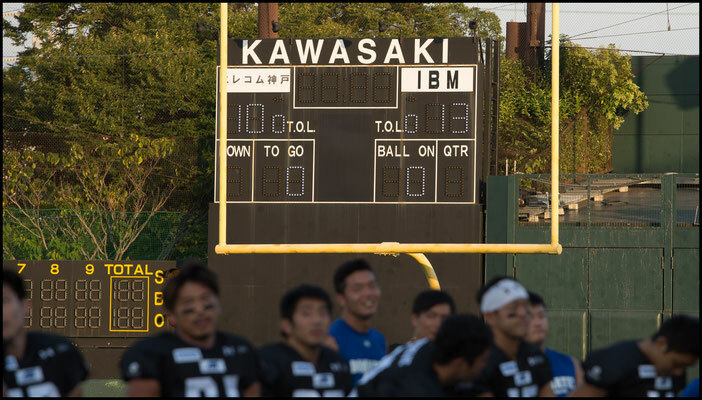 In the end IBM drove from their own 10 to the Kobe 17 yard line and, with 15 seconds left kicked the equalizer. 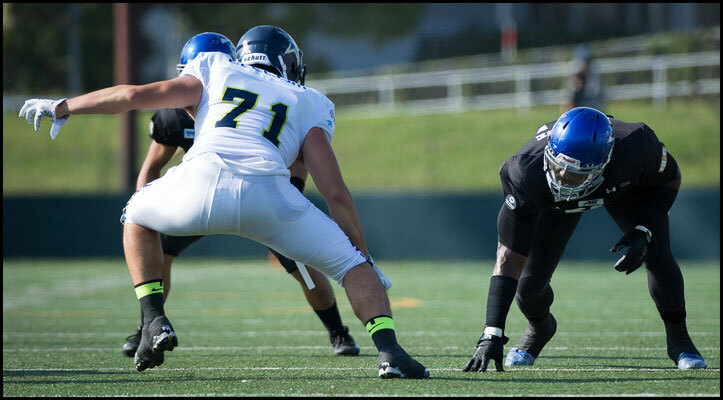 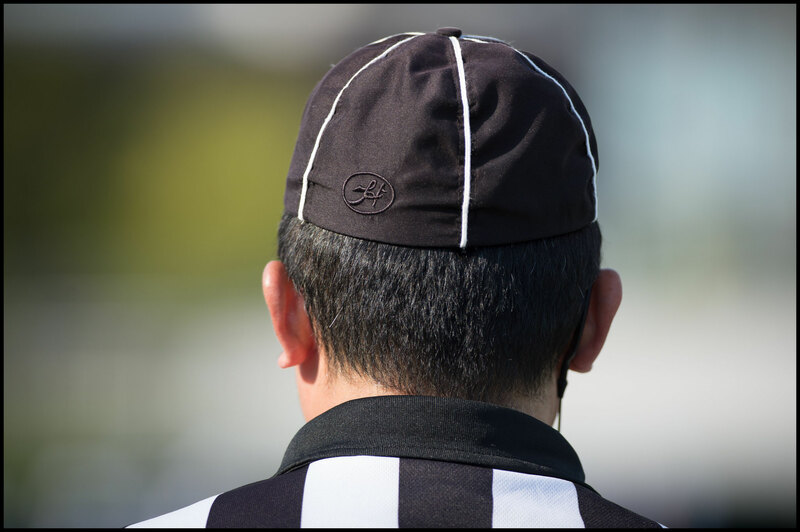 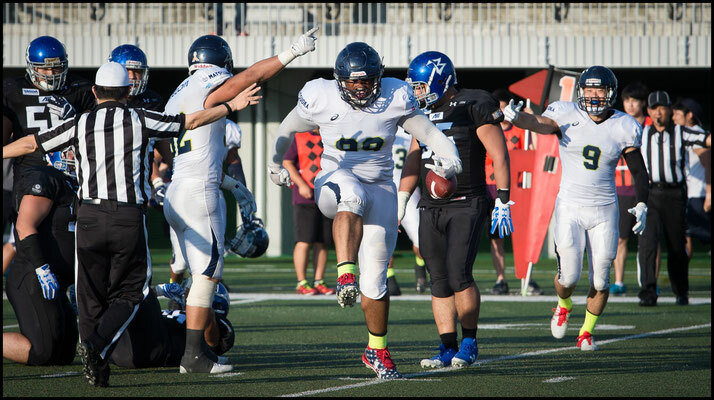 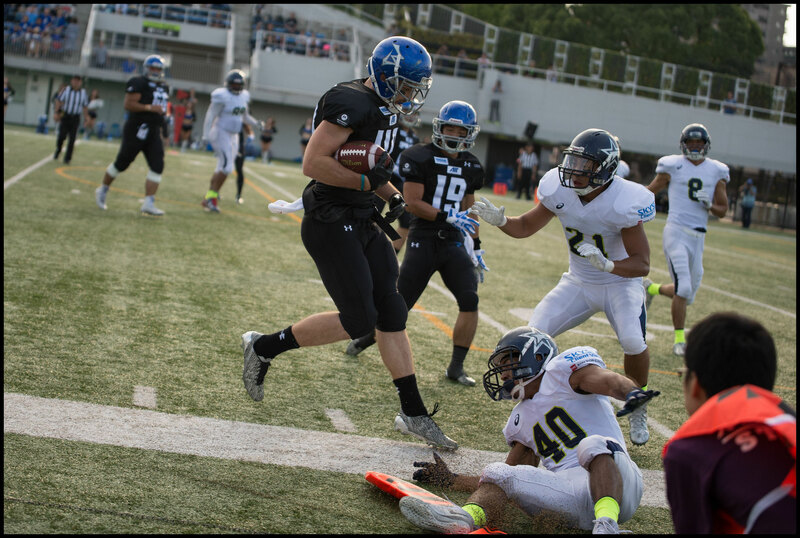 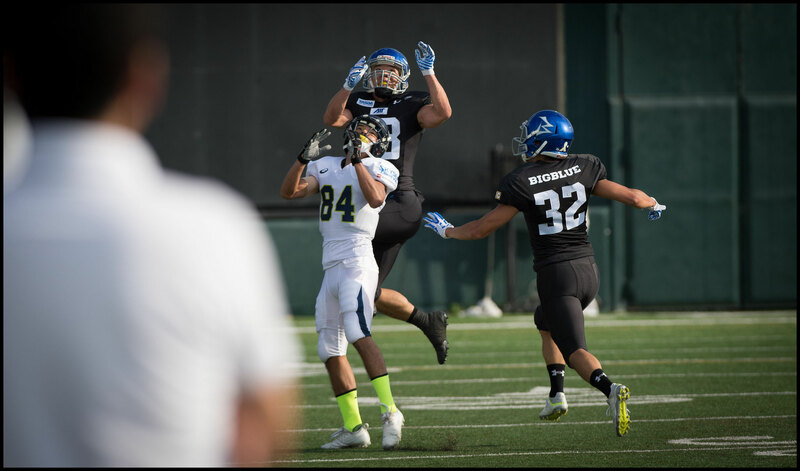 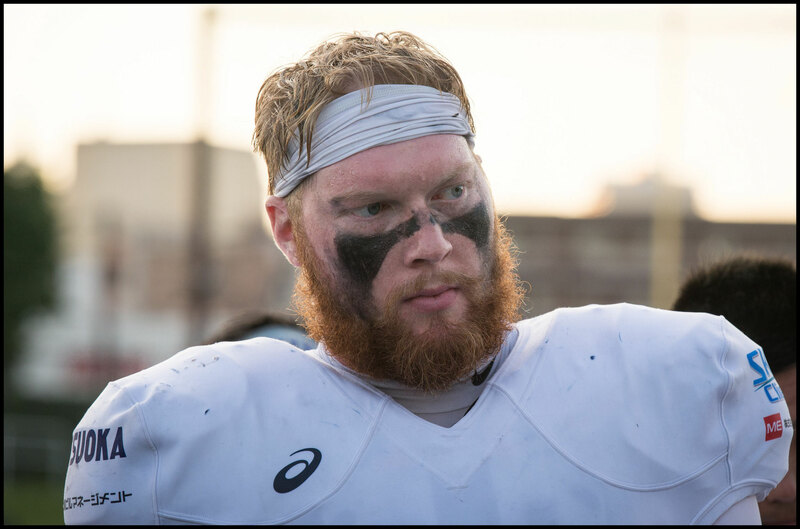 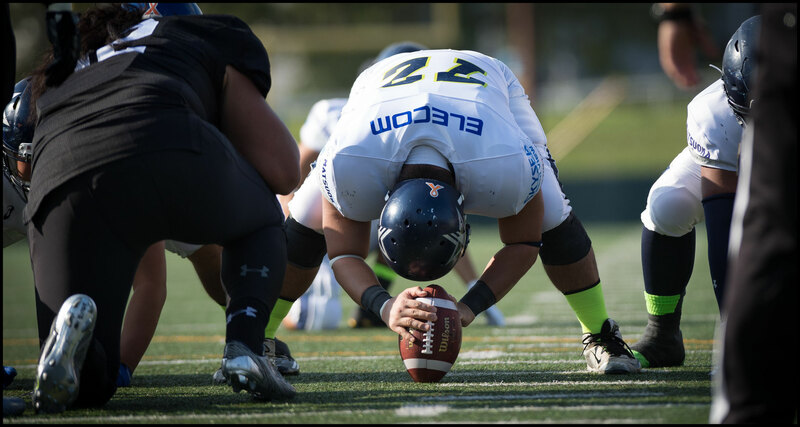 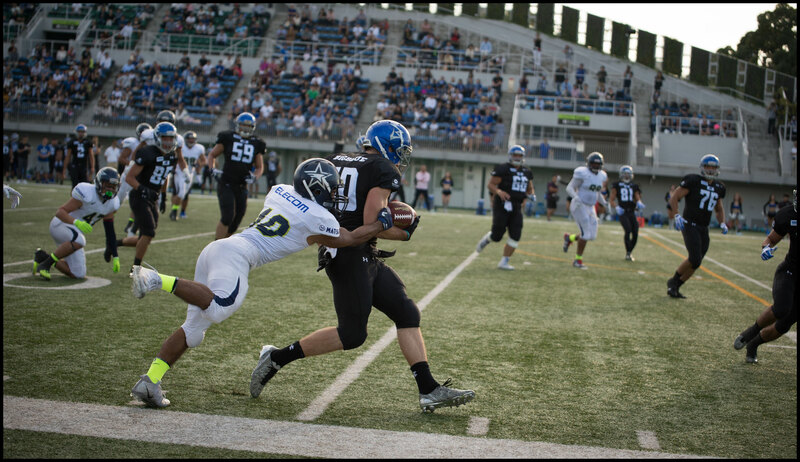 Overtime rules in the XLeague sees teams getting possession at the opponents 25. 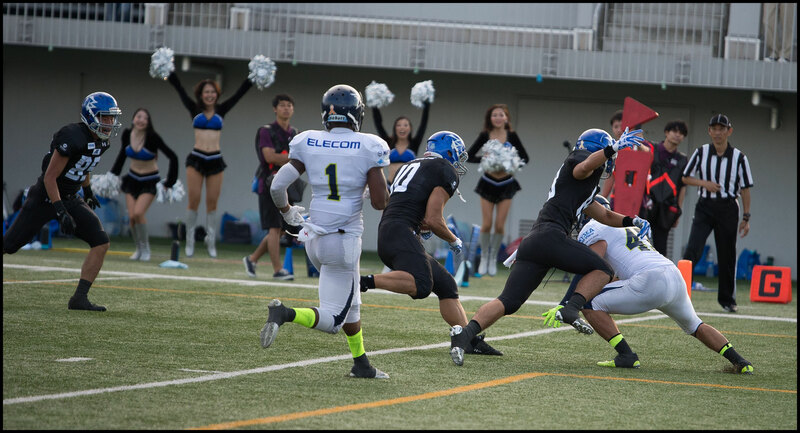 IBM got the ball first and promptly fumbled it away. 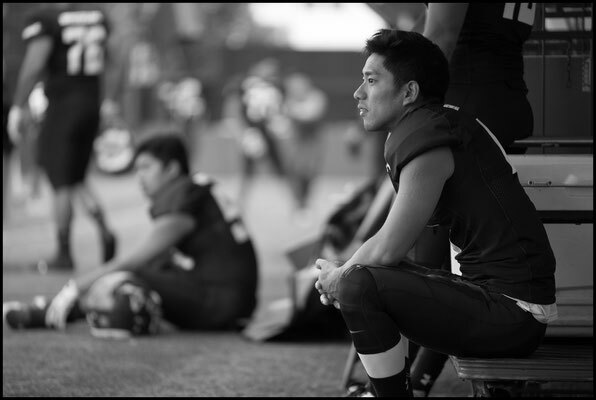 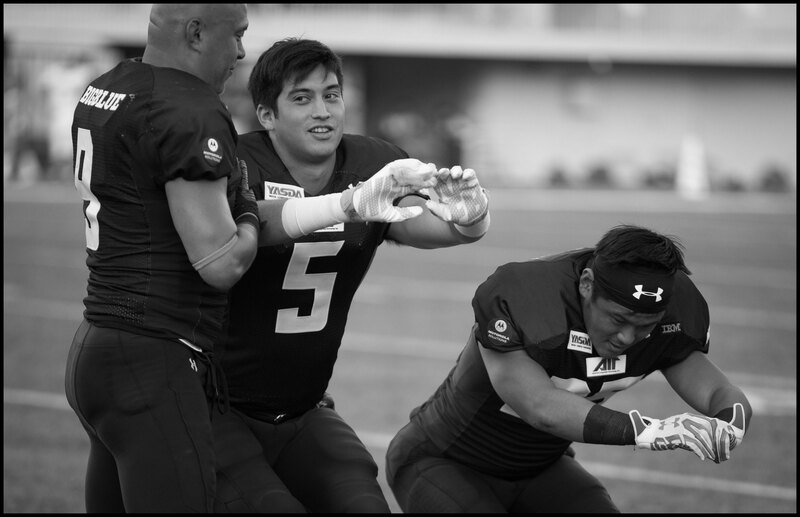 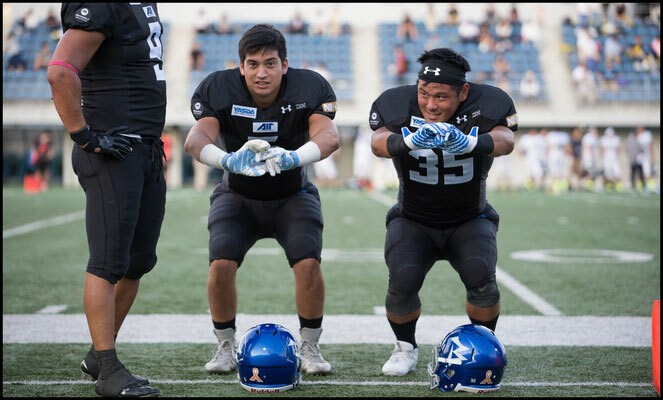 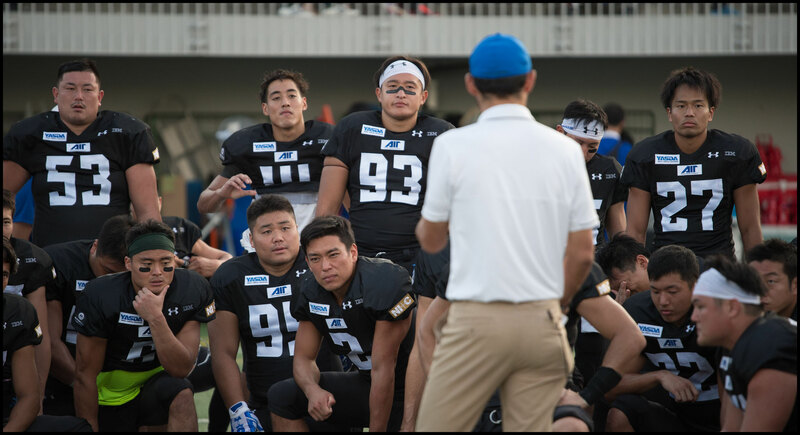 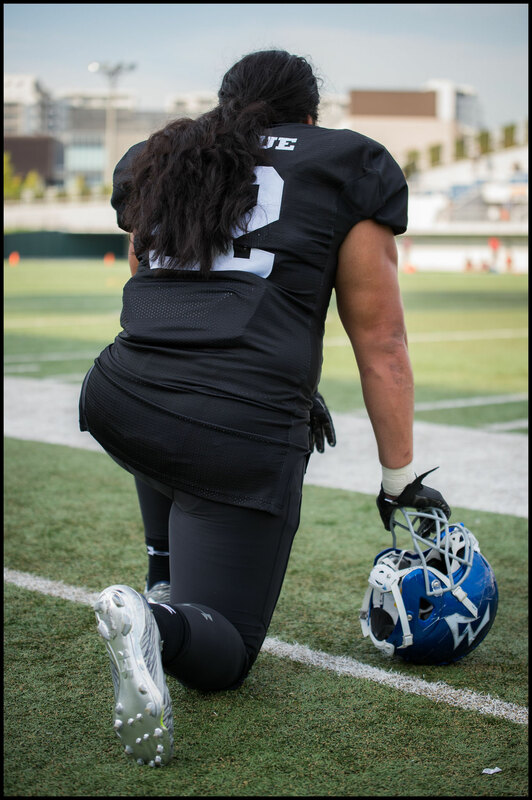 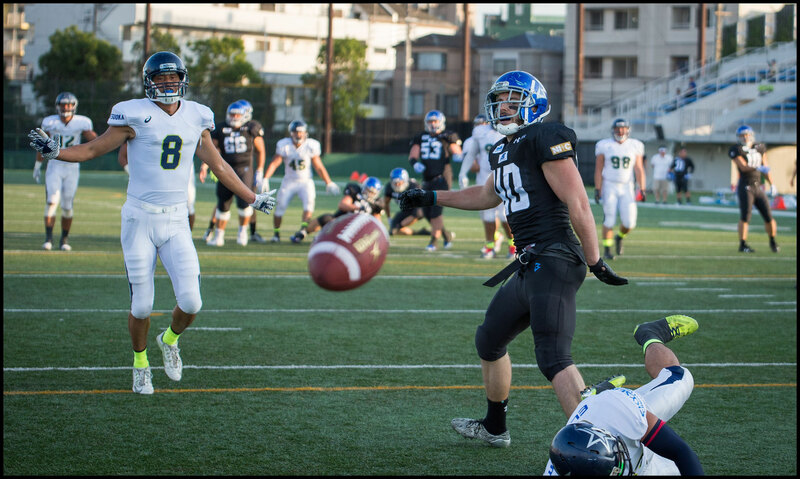 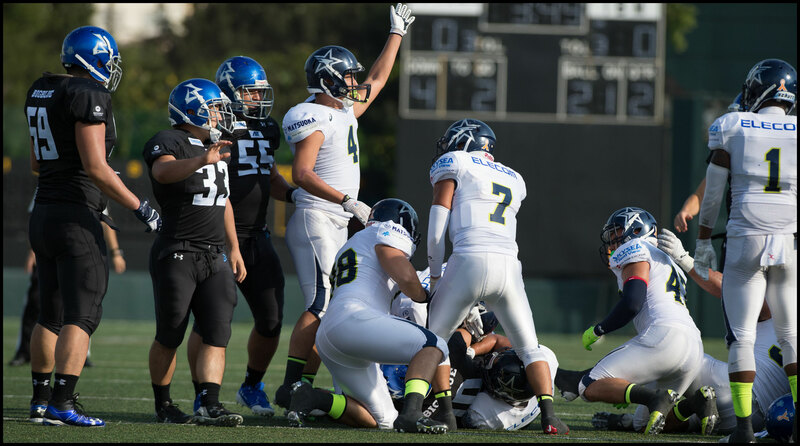 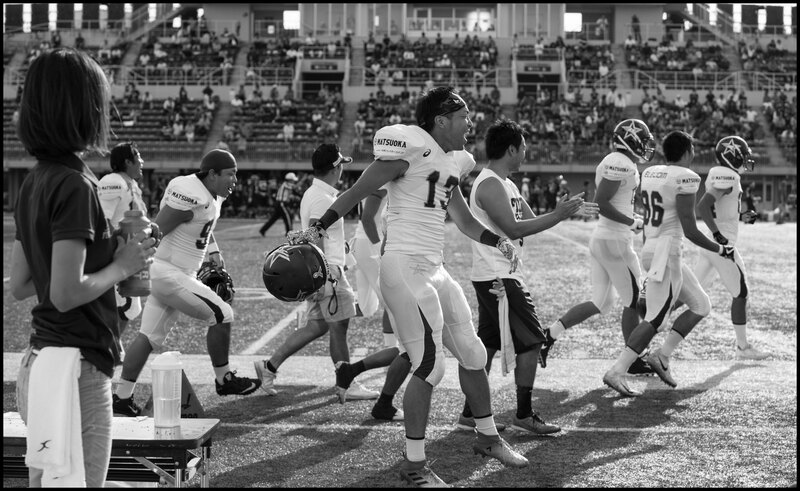 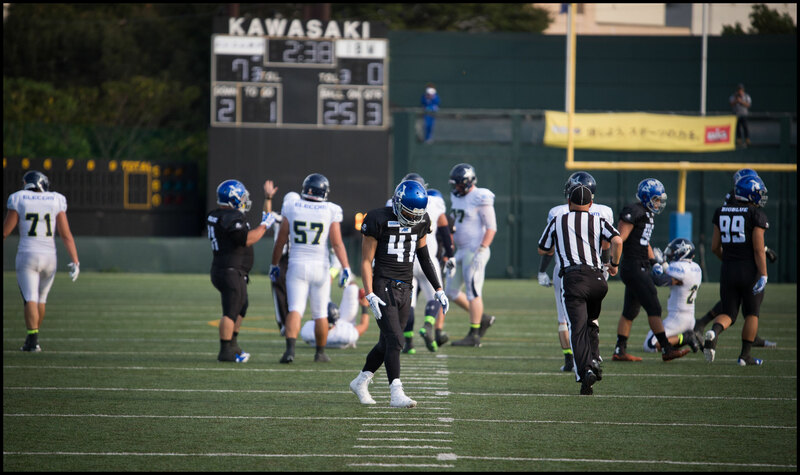 At that stage it seemed there was no way Kobe could lose but the missed FG, subsequent interception by Kobayashi and Sato's winner left the Finies players stunned. 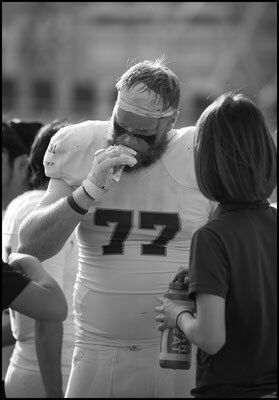 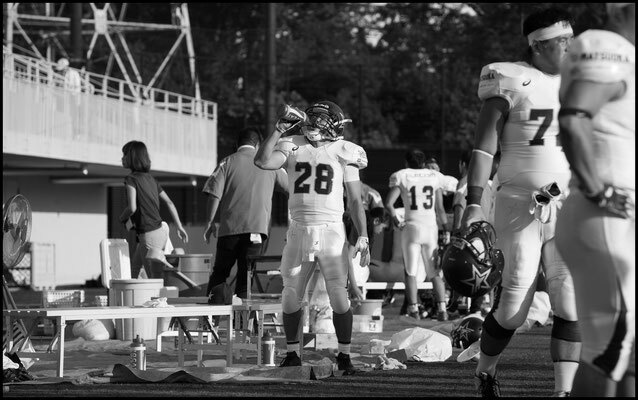 On the sideline afterwards heads weren't down though. 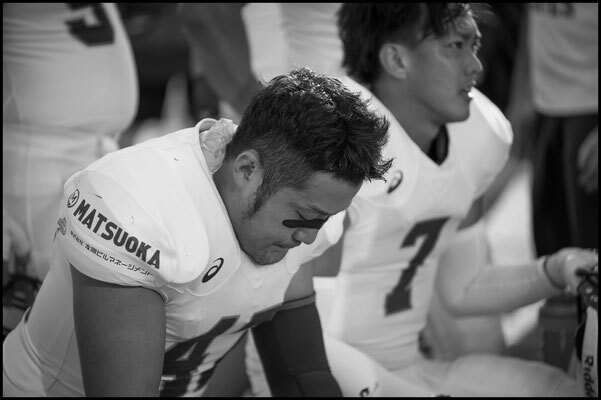 Though visibly disappointed by the loss, several players and coaches spoke with a sense of resolve and determination. 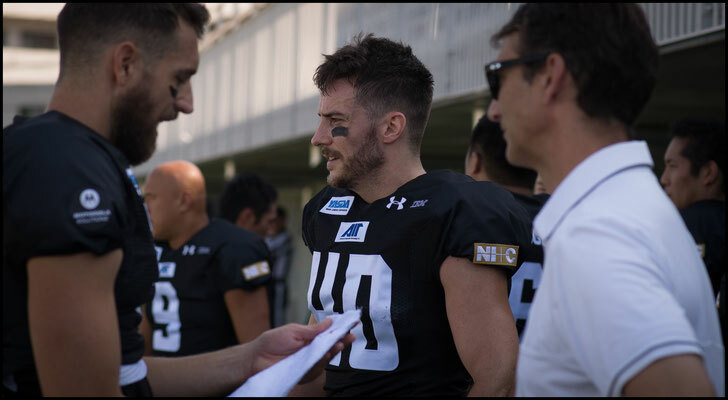 The Finies were big underdogs coming into the game, which in hindsight underestimated how well they have performed in 2017. Apart from the first part of the opener against Panasonic they have been a match for every team they played this season. 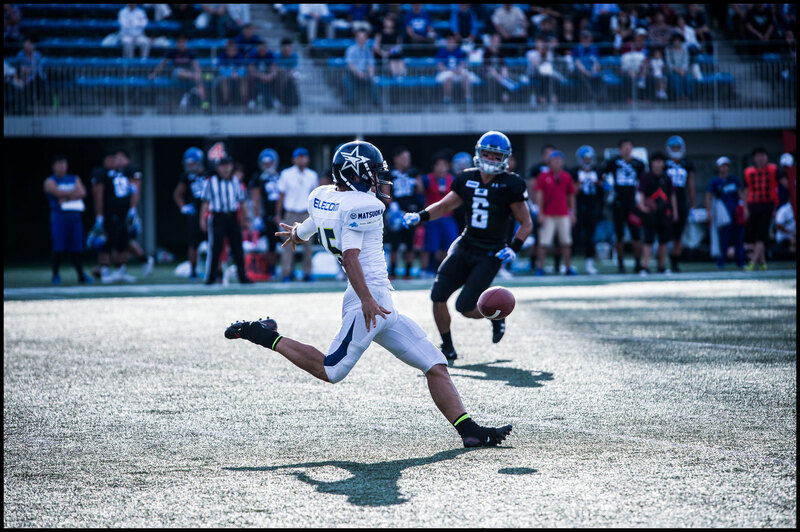 Kicking is obviously a concern anytime you go one of four, and the offense needs to be more clinical in the red zone. Wada and Kenji Tsunekawa are good receivers and Elecom need to find ways to get them the ball more. 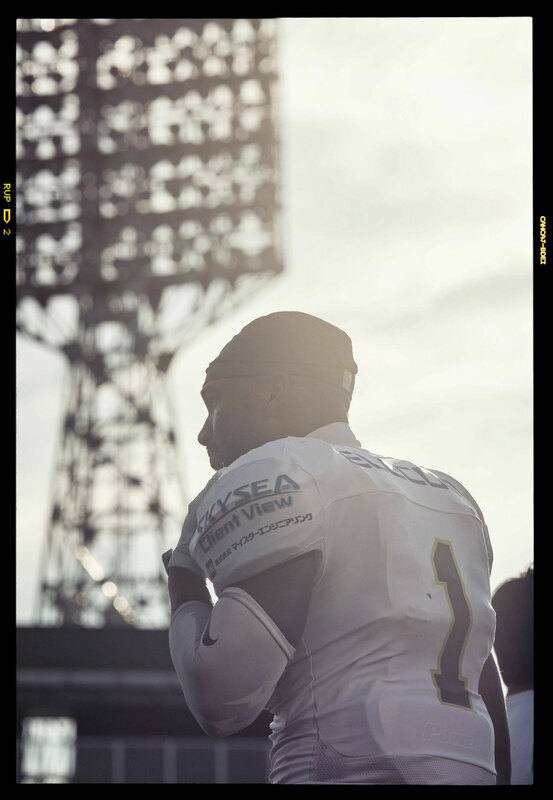 With the defense playing lights out though Kobe will be a handful for whomever they face in the playoffs - assuming they get there. 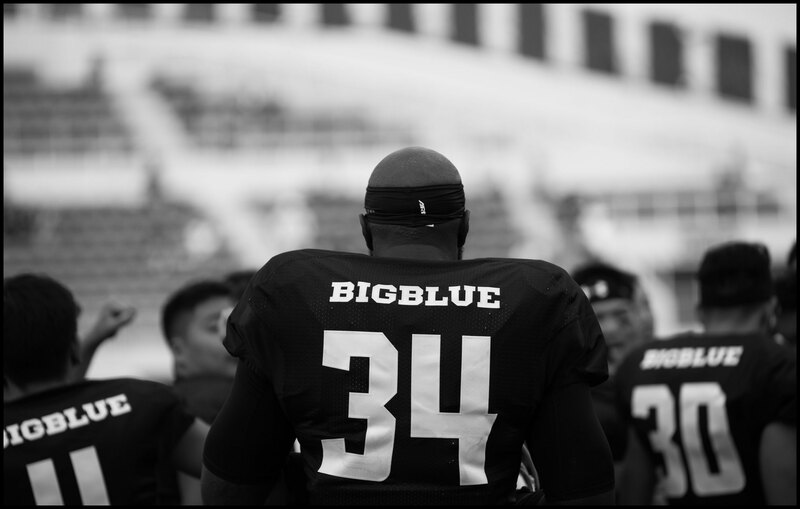 For Big Blue the suddenly stalling offense will be a concern. 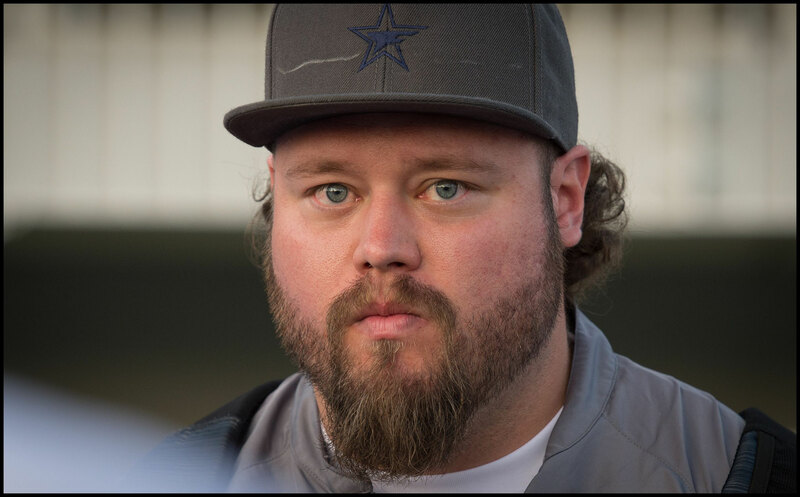 It's clear that several players aren't fully healthy but with the prolific Deers next on the schedule they'll need to get back to their free scoring ways. 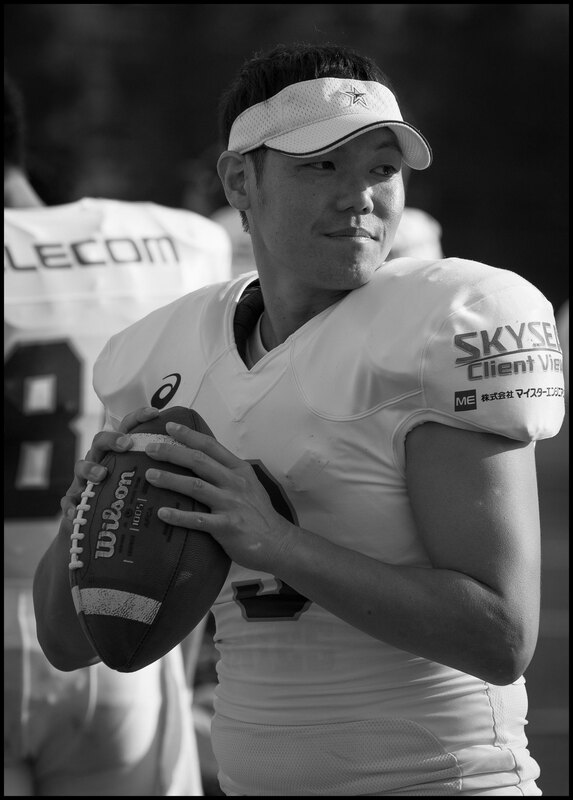 Lixil are a team with a defense that Yuki Masamoto can use his mobility to exploit. 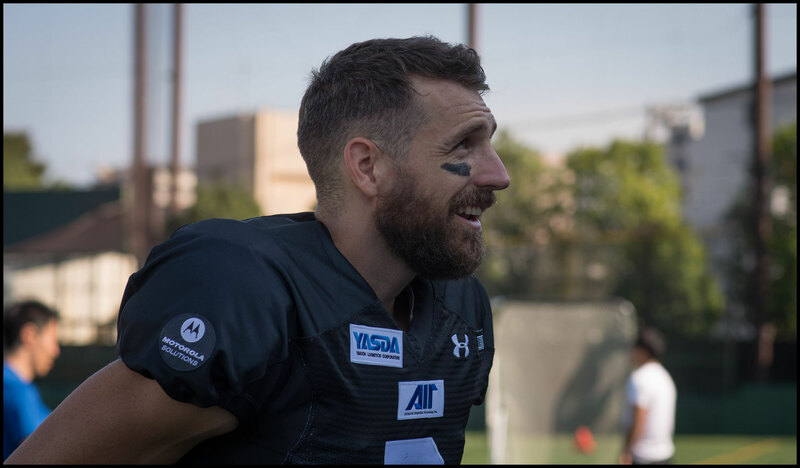 Both IBM QBs though have followed up big plays with interceptions several times this year, and Deers are not a team you want to give a lot of possession to, so ball security will be a focus going into that game. 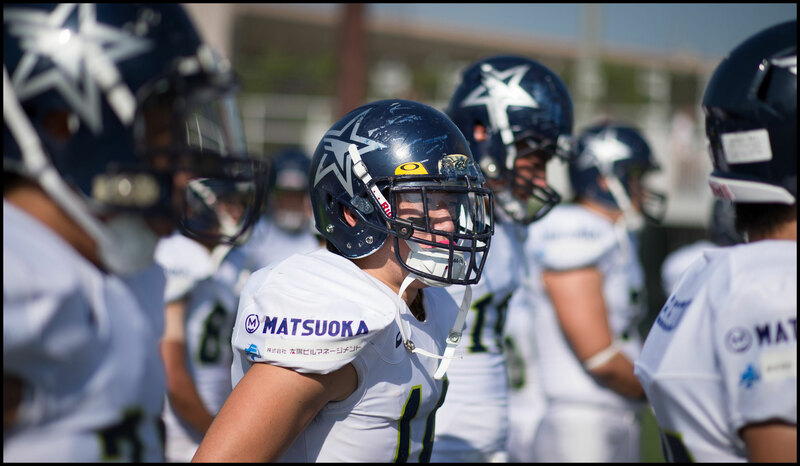 John Stanton had just one catch for 11 yards against Finies. 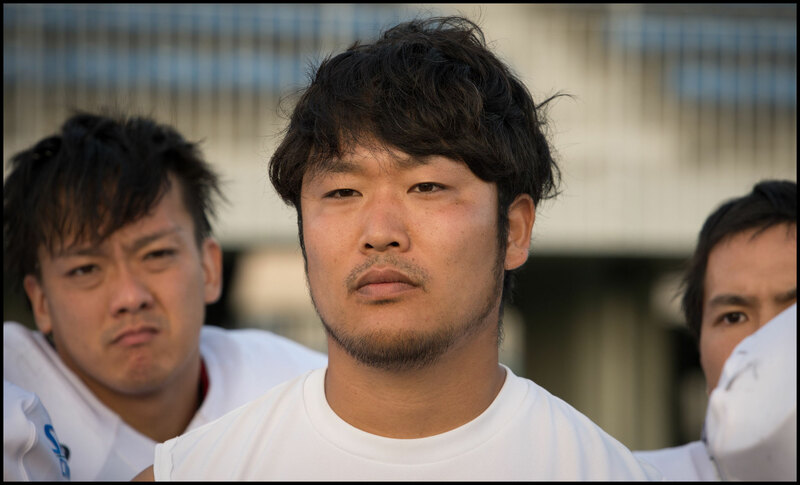 Big Blue need to get their top target going if they want to open things up for Takeshi Kurihara and Atsushi Uehiro on the outside. Stanton has been particularly effective from stacked alignments this season so look for those to feature more against Lixil.